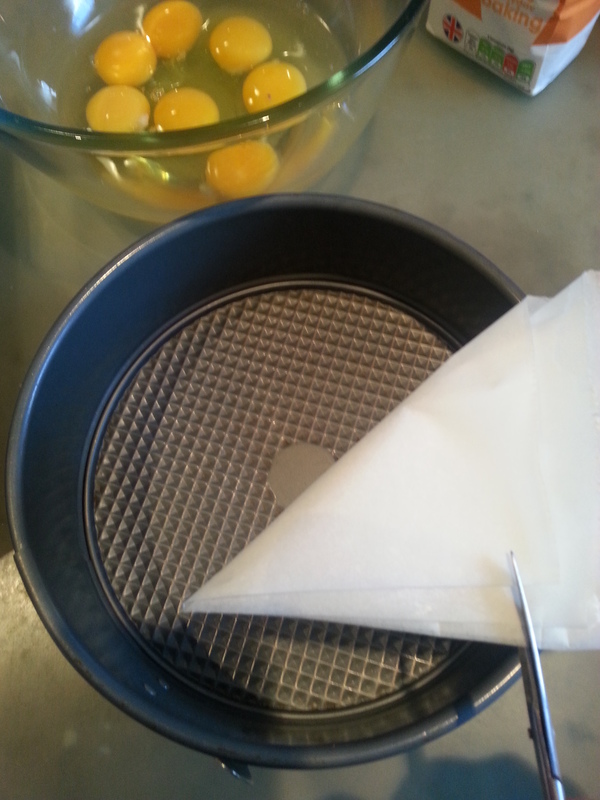 Line the bottom of the 20 cm/8-inches round-spring-form cake pan with parchment paper. 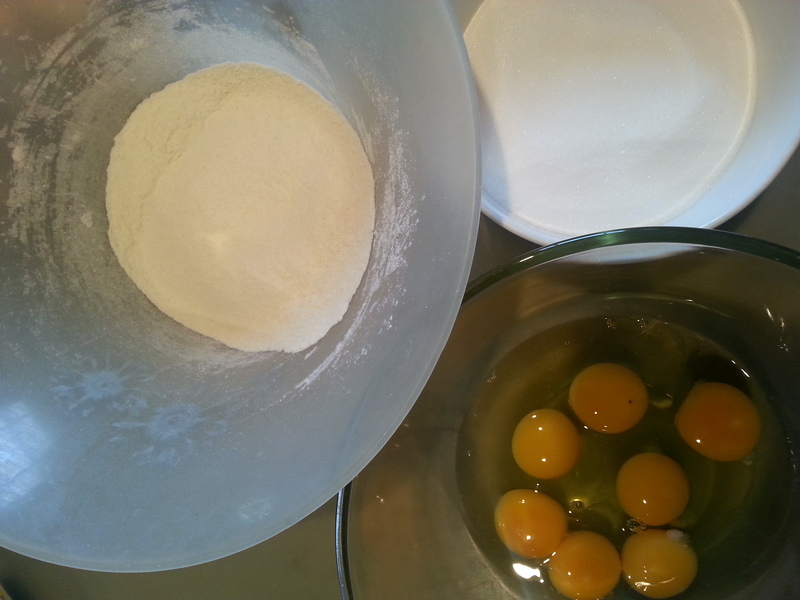 Initially mix egg yolks, sugar and flour in a ball with the whisks until its light and fluffy. In a different ball, mix egg whites on a high power until you reach stiff peaks. Carefully fold in the whites with the batter until fully combined. Bake for 180C for 30 min. Take it out of the oven, leave it cool before you take it out if the tin. Once it’s completely cold, cut it in half. If you wish to make bigger cake, you can just increase the above ingredients proportionality (for example for 10-inches cake tin, you can use 9 egg yolks, 9 tbs sugar etc). Prepare the same as above. 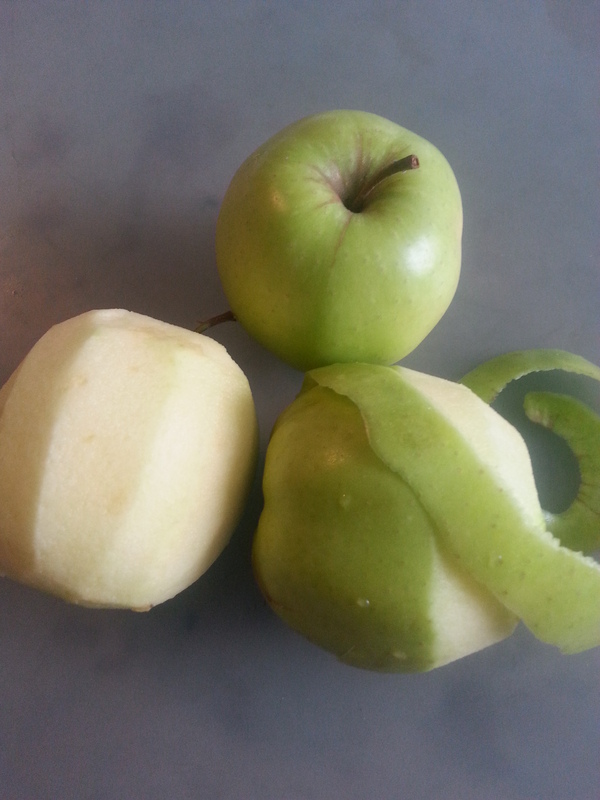 Once it is all nicely folded, divide into three parts. 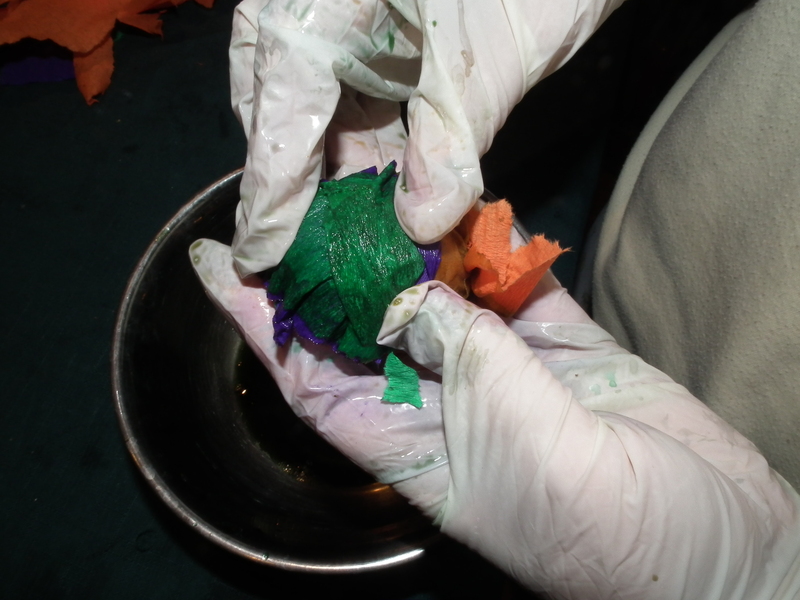 In one add some green food colouring ( I used Sugarflair Colours ), in the second part add red and in the third one add purple. 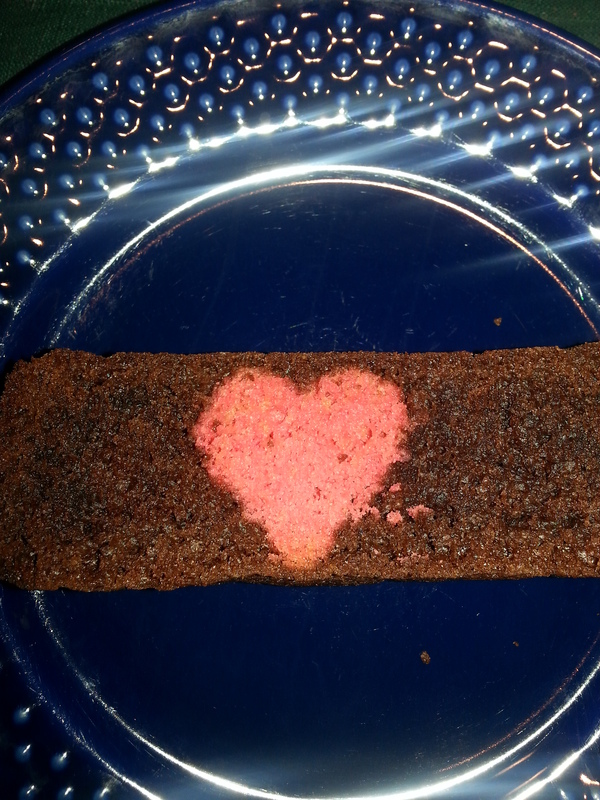 I baked the sponge in a rectangular tin, adding one part after another, without any mixing between the colours. Again bake for about 30 min on 180C. Once its cooked and cooled, you have cut this into small dices so do not worry if does not look perfect at this stage (you will have now wonderful green, red and brown sponge cubes). Cook all ingredients on a low heat until all combined and sugar is completely dissolved. At the end add zest and juice of two oranges. Once mixed, add the cut sponge dices and plenty of rum! Put the first layer of the cake on the cake stand. Cover it with the layer of jam (again I used apricot). Add rum punch mix (diced soaked sponge). 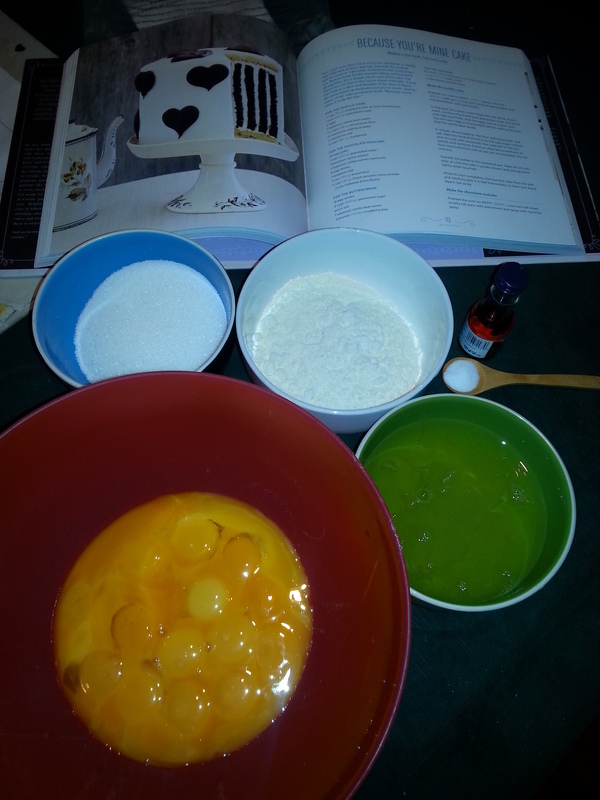 Cover the second sponge layer with the jam, put it on the top of the cake dices. 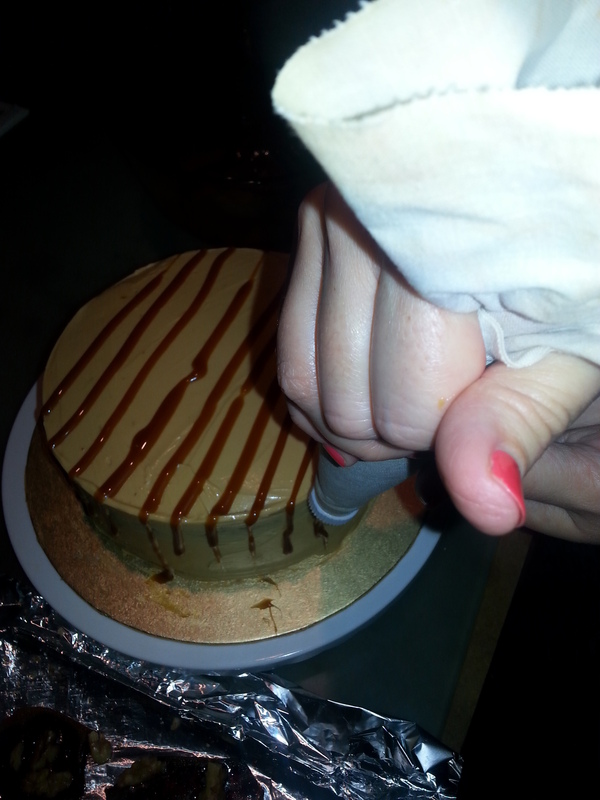 Press it with your hands, making sure that all the rum punch dices are inside the cake. You can actually assembly the cake using the cake tin as that will keep it in place until the cake is fully set. 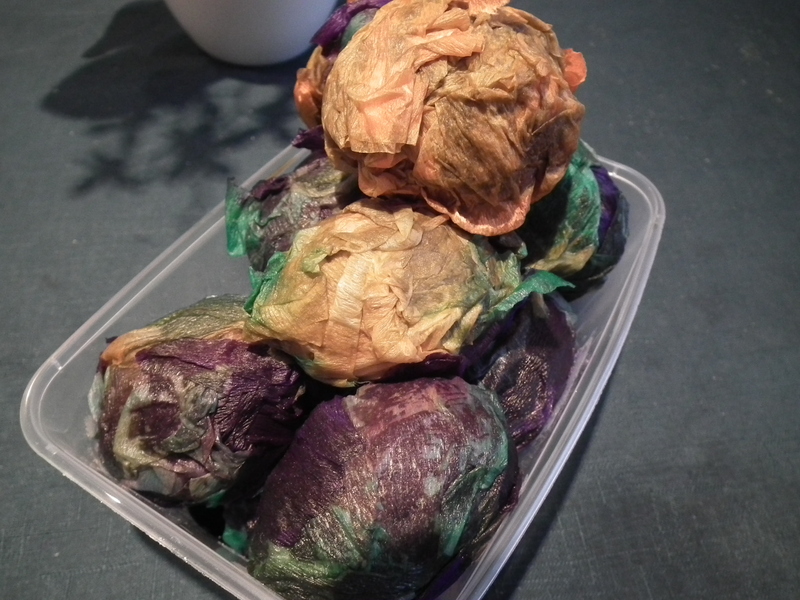 Once set, add the rose icing on the top which you can make with icing sugar, lemon juice and some red colouring. The best will be if cake is left in a fridge for a couple of hours to completely set and that all the cake dices are nicely soaked in a wonderful aroma of oranges and rum. When my friend asked me to do her wedding cake, I was jumping up and down with excitement and joy. I never baked a wedding cake before, but secretly always wanted to. Luckily I started the whole process in advance as wanted to plan every single detail throughout this journey. There was a moment when I doubted my abilities and skills and regretted accepting this challenge. Doubt came especially when I was thinking about staking the cakes and whether to freeze it or fridge it. You may laugh, but I had sleepless nights because of that. I was particularly concerned about the delivery of this cake for 100 people from London to Somerset (170 miles). I did a lot of research and, oh boy, there are so many videos, blogs and articles about almost every step of the wedding cake making. But it’s not easy to find straight away what you want. There is loads of advice out there but I trusted my instinct a lot. The book that definitely help me in my journey was Victoria Glass’ Boutique Wedding Cakes. The cake I made had three tiers which were representing the bride and groom and all the recipes were from Victoria’s book. I could not praise it high enough. She described everything in details and answers a lot of questions that no one dare to ask! 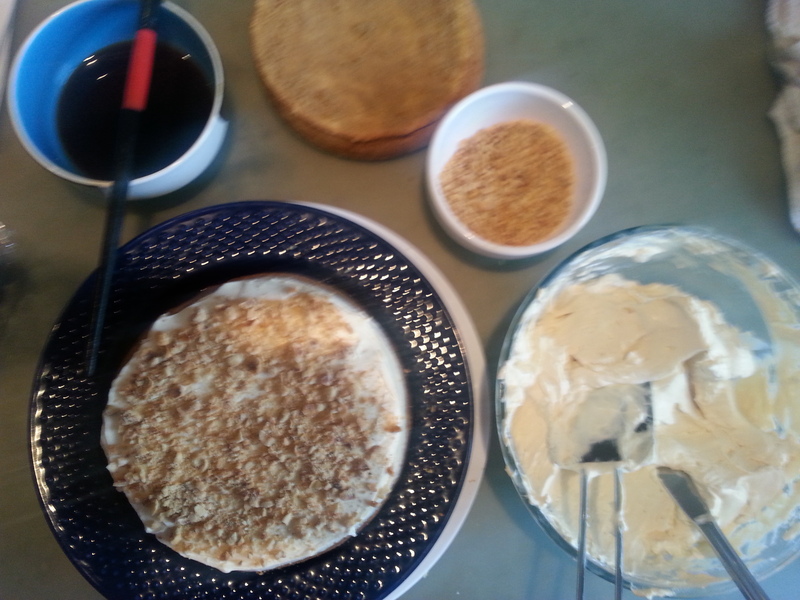 I start preparing the cake eight weeks before the wedding. I created a spreadsheet that was showing what I need to do every week leading up to the wedding. I also added what ingredients and equipment I need to buy as well as how much it all cost so that I can keep it all under the budget! That way I would not forget anything and could time manage. Bride and groom choose what flavours they wanted in the cake’s tiers. We wanted the cake to represent them both and their wedding day. They decided that bottom tier will be very traditional rich fruit cake. Middle cake was chocolate cake with chocolate fudge, as the groom love chocolate and the top tier was green tea with ginger buttercream to represent Japan. The bride and groom met through a Japanese friend and the bride spent two years living there. 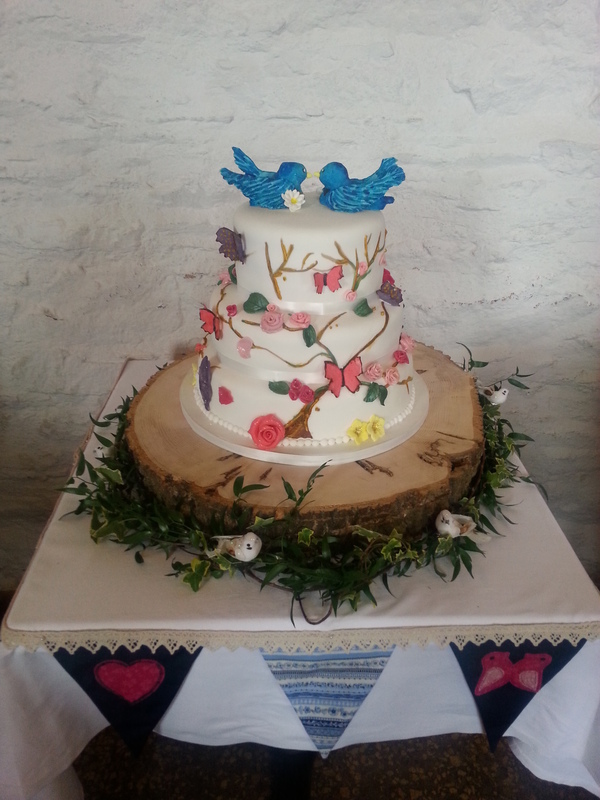 We decided to decorate the cake with some cherry blossom, butterflies and birds as they both love nature and birds watching. That was the easy part! Rich fruit cake was made 6 weeks before the wedding and I was feeding it with the rum every week. The whole house was smelling of Christmas in July! 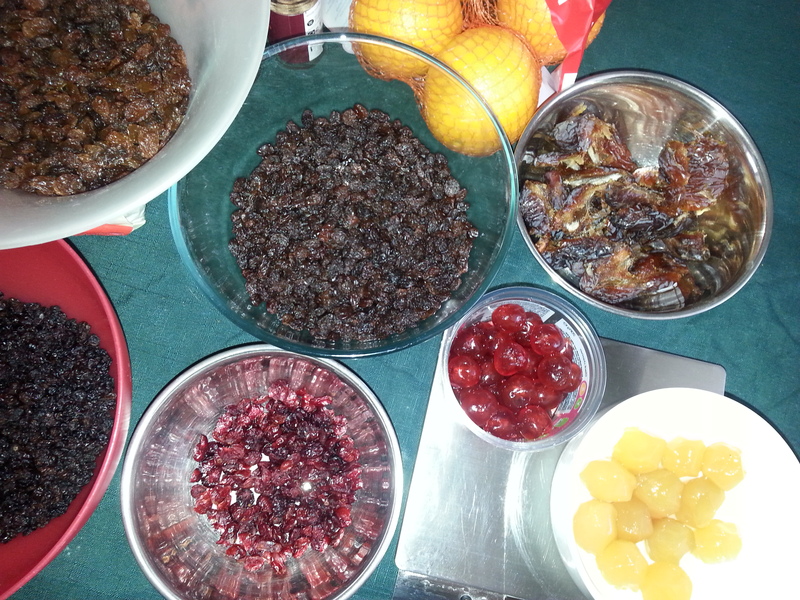 I never made a fruit cake before and was slightly concerned. Luckily when I was doweling the cake, the dowels I used were hollow so when I was leveling them I managed actually to take some cake out and try it before stacking another tier. 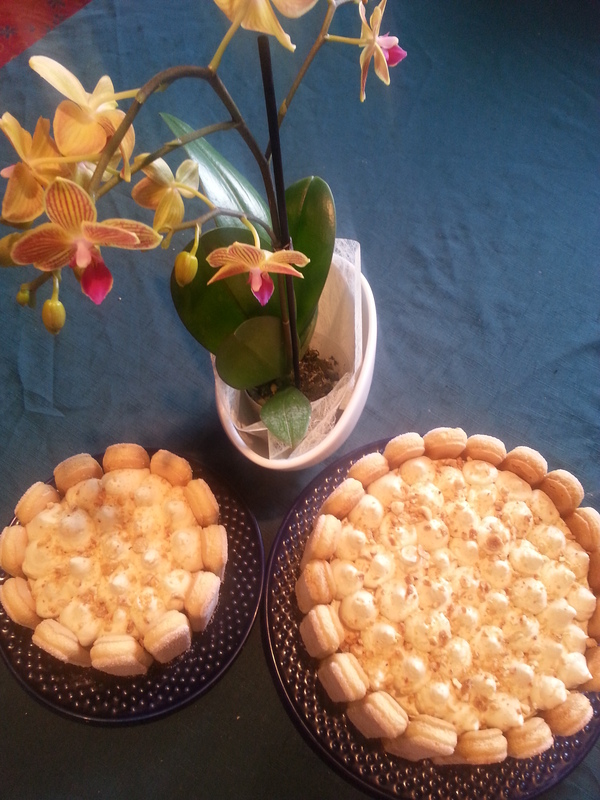 I had full confidence in other tiers as I made them before and serve them to my friends in the cake club. They all loved them and were very complimentary. Before making a wedding cake, definitely test it with your friends and family to make sure that they all like the flavour and that cake consistency is good enough to be used on the wedding cake. I start making flowers, leaves, butterflies and birds a week before the wedding so that gives it enough time to dry and gives me enough time to paint it. I really enjoyed doing them, but I have to say, took a lot of time! This is where I was testing my patience. 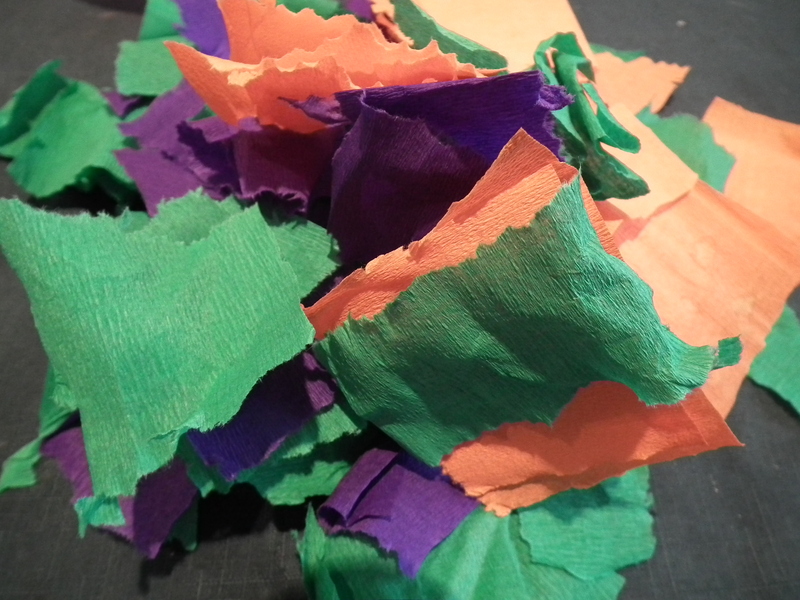 I discovered this wonderful material to work with: sugar florist paste, ultra-fine and pliable flower paste. 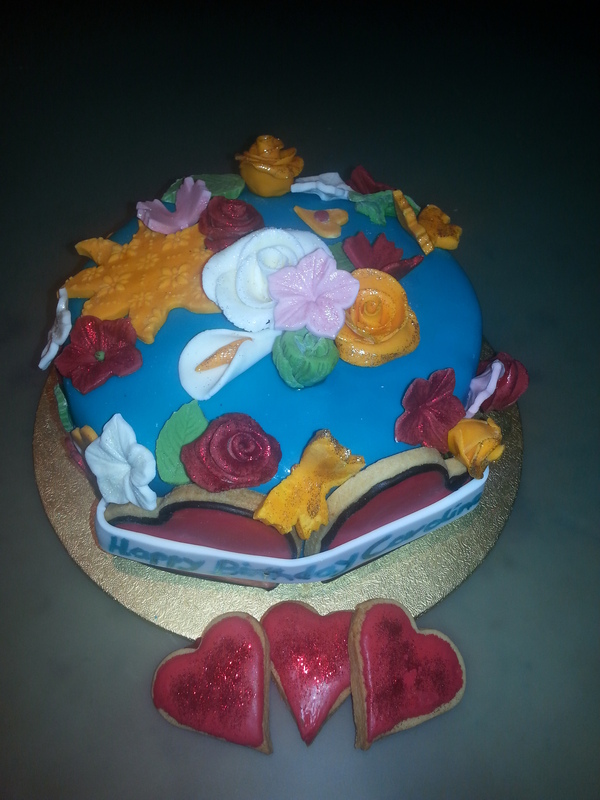 It’s so much better to use for flowers and leaves than the usual fondant icing as it’s so thin and dries much quicker. I also bought this wonderful ball tool to use when making thin leaves and flowers. They were all made of sugar florist paste, and then hand painted. The decorating the cake was the most fun and exciting part of the wedding cake making. I hand painted the tree on the cake, and then use some royal icing to add the texture on the branches. I then added flowers, leaves and butterflies. The cake was delivered in a car. Instead of trying to find the special cake box, I just bought the normal heavy cardboard box which worked just fine. I spent 30 hours on this cake but just seeing my friends’ happy face and delight when they saw the cake, it was worth every minute I spent on it. Everybody liked the cake and I was even mentioned twice in the speech. In the end of the beautiful wedding, there was nothing left of the cake, only the love birds. I really enjoyed the whole process. It was not easy. It’s expensive and took a lot of time, but I really loved the whole journey in the wedding cake making. I would definitely do it again! My very good friend asked me to do bake a wedding cake for her. It is a huge challenge as I never attempted a three tier wedding cake. 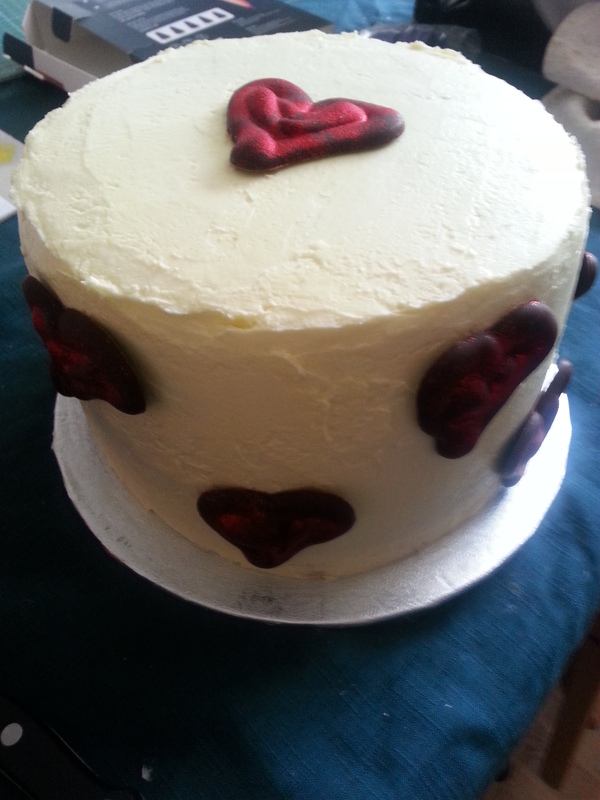 I once made a single tier cake for a friend’s wedding but that was not the main cake so I felt less pressured. I am truly honored that my friend thought that my baking skills are good for her wedding cake. I am sure it will be fun making it, however I need to think very carefully what flavour cake to make to represent both the bride and groom. As my friend lived two years in Japan and met her future husband through a Japanese friend, one of the tiers must represent this interesting country and its flavours. There is no better way to showcase it than the green tea. 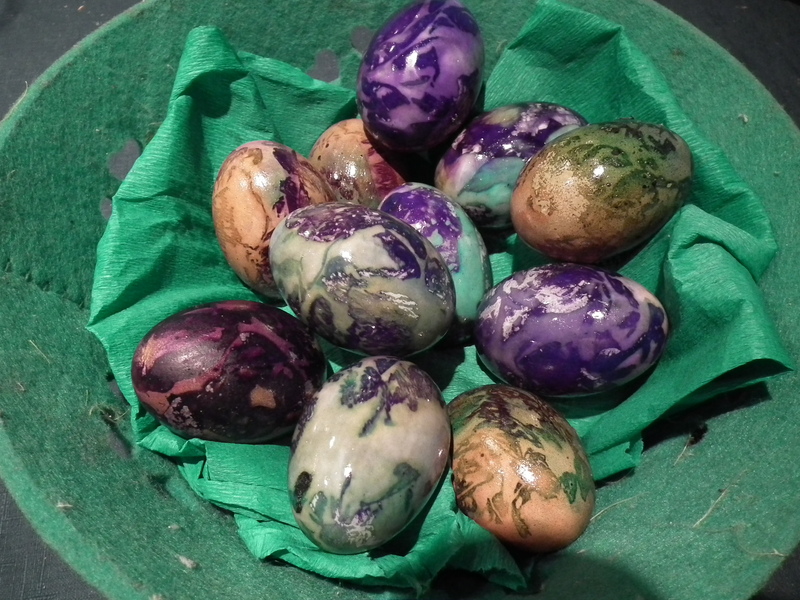 I used Victoria Glass’s recipe Spring Flowers from her Boutique Wedding Cake book as guidance. 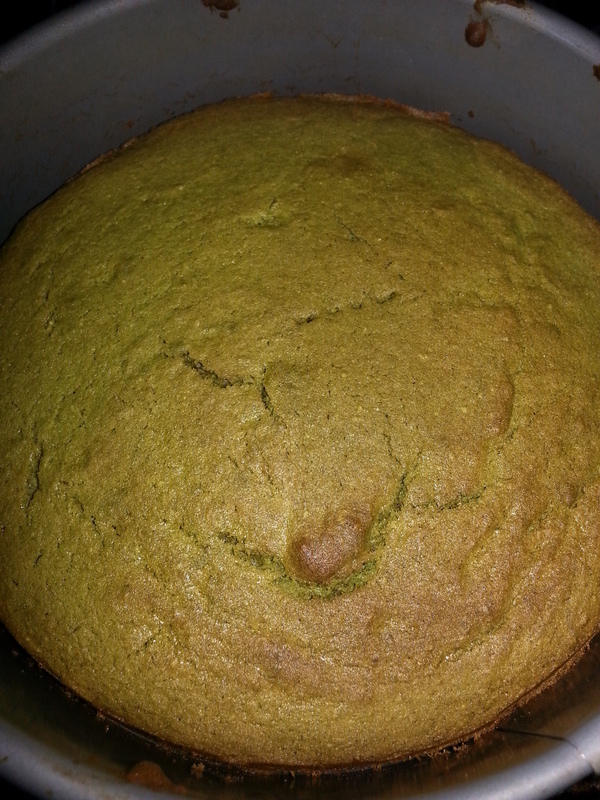 I used matcha powder which is very trendy at the moment and very accessible to buy. It ain’t cheap but it is worth it. 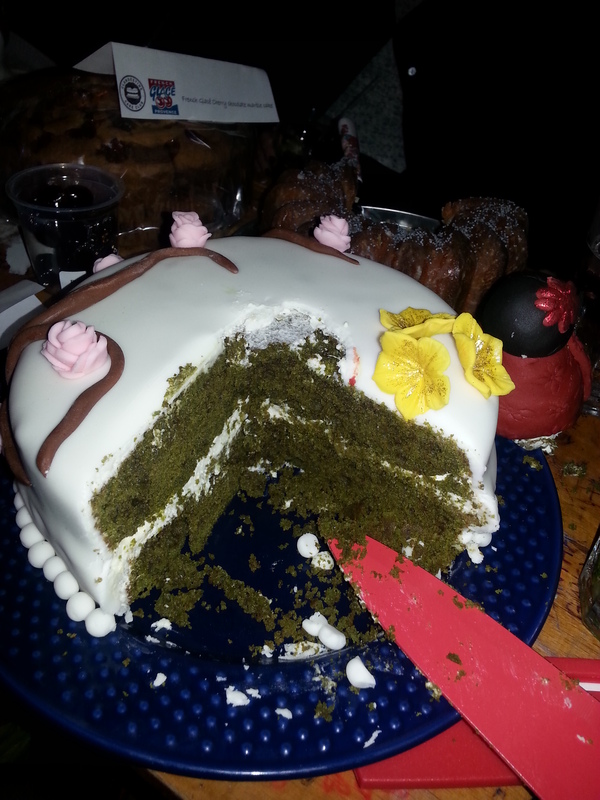 The cake was green, moist and very delicious. As this was a trial, I made it in 20cm/8 inch round tin and decorated it in cherry tree blossom and a Geisha made of fondant. Preheat the oven to 180C. 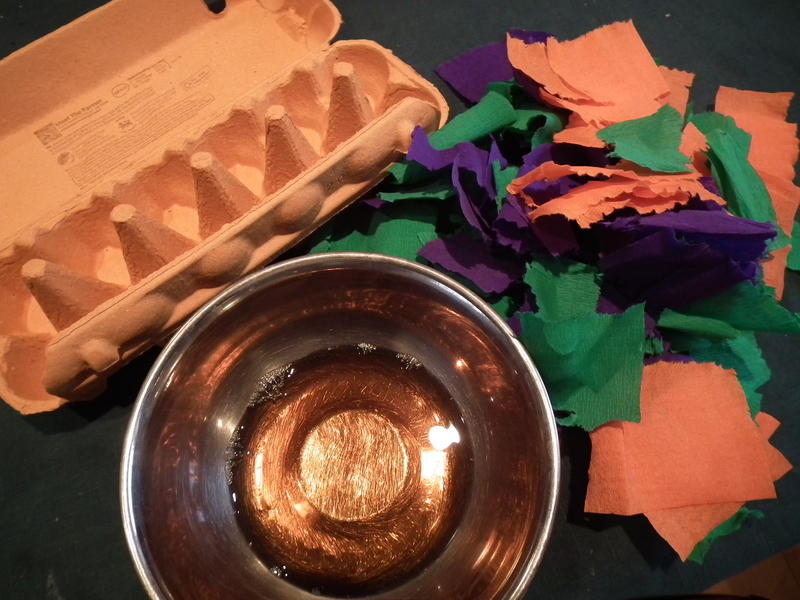 Prepare two 20cm/8 inches round tin, butter them and line with non-stick baking paper. 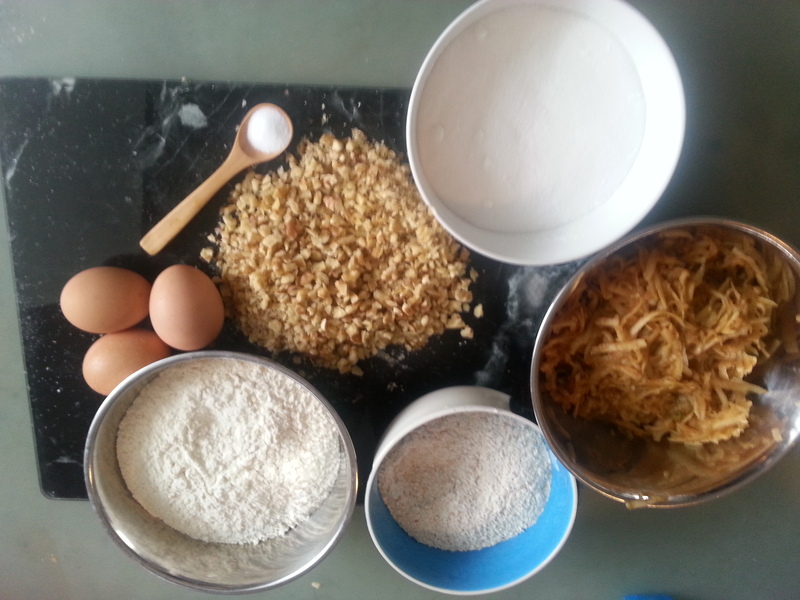 Put all the ingredients together in a large mixing bowl and whisk for a couple of minutes with an electric whisk. Once everything is well combined, light and fluffy divide the batter between two tins. Bake in the pre-heated oven for 20-25 minutes, or until an inserted skewer comes out clean. Turn onto a cooling rack and leave to cool completely. Prepare a buttercream. Whisk the butter with an electric whisk until fluffy. Sift over a half the icing sugar and whisk again until fully incorporated. 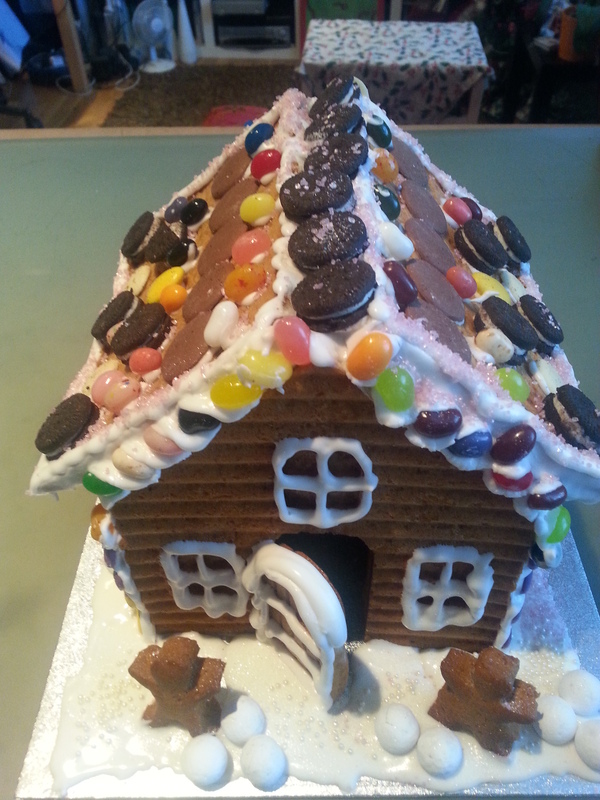 Whisk through the ginger syrup before sifting over the remaining icing sugar and whisking through. Add the cream cheese and whisk again. Fold through the chopped stem ginger. Sandwich the cakes together with half of the buttercream, then spread the remaining buttercream over the top and sides of the cakes with a palette knife and leave to set. Cover the cake with the white sugar paste. You can either leave it as it is or decorated with what ever you fancy. 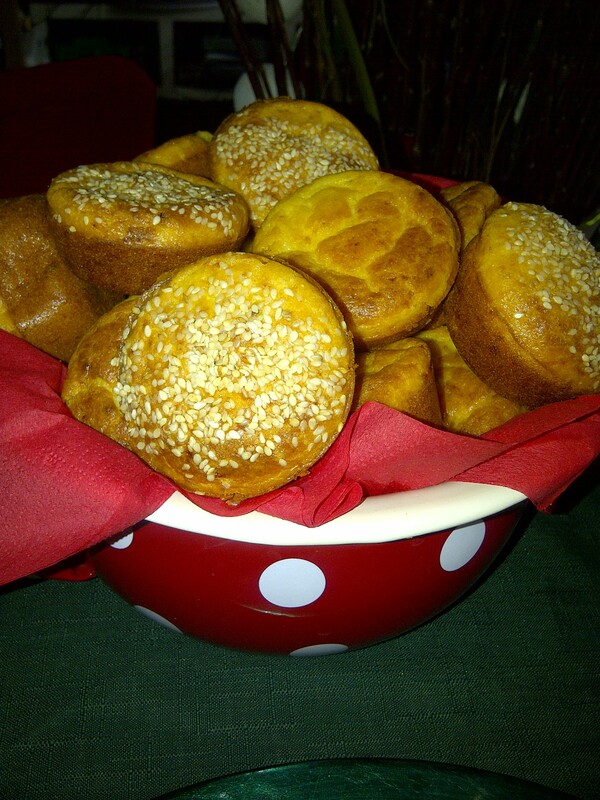 Besides boiled dyed eggs, ham, spring onions and radishes, we also eat special bread baked for sunny Eastern morning. 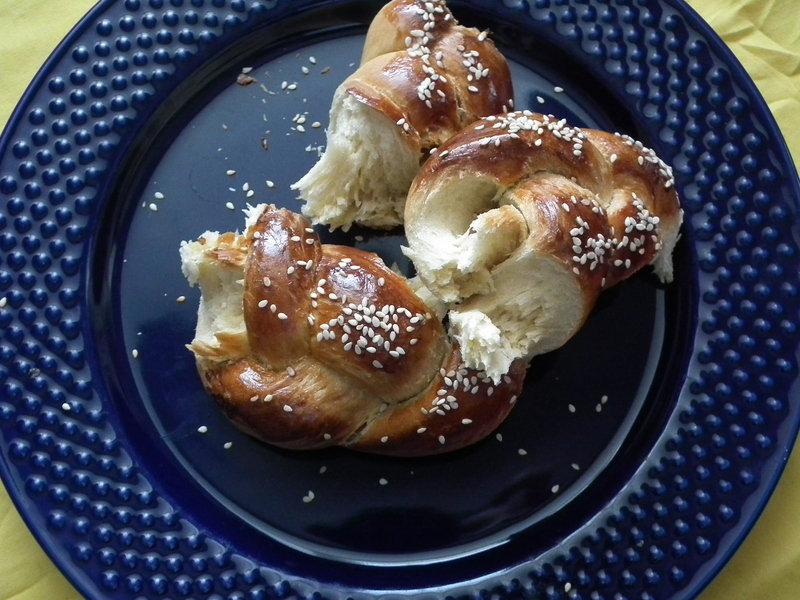 This beautifully crusty, slightly sweet bread is made into three, four or even six strand braid eaten on its own or with butter. 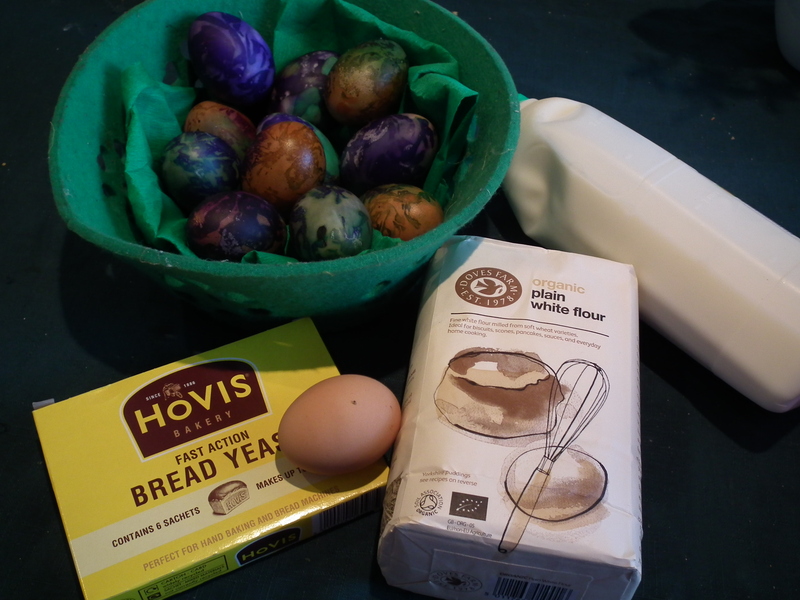 Many European families made this bread circled around a boiled egg. 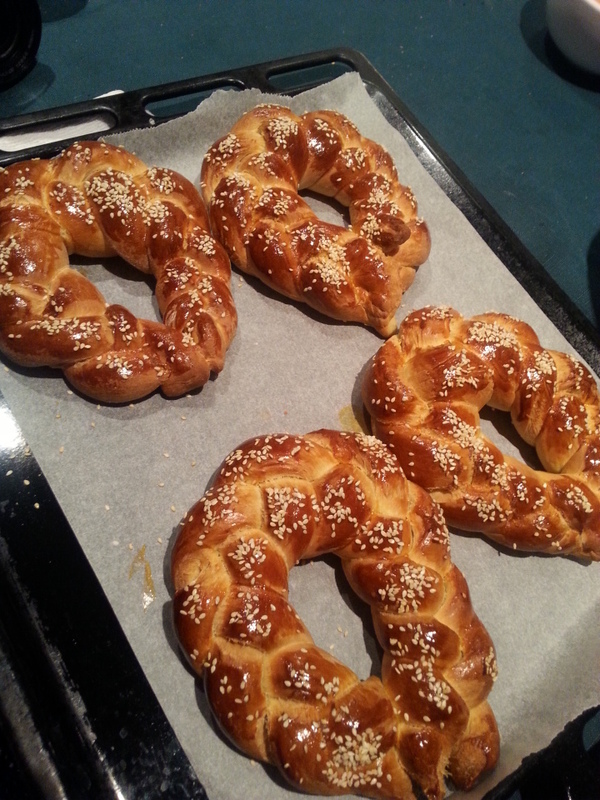 I made four small braided bread for each member of my family. It’s very easy to make and trust me so delicious. 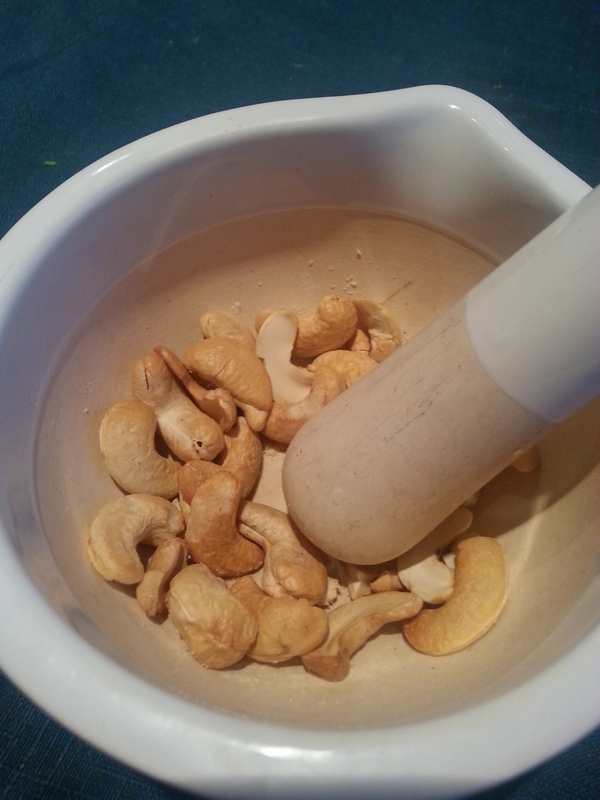 In a large bowl, combine all dry ingredients together: flour, sugar, salt and yeast; stir well. Add egg and yolks in the middle of the dry ingredients. Gradually add the milk and oil to the flour mixture; stirring constantly. Knead for about 5 minutes in an electronic mixer fitted with a dough hook, or turn onto a floured surface and knead well for 10 minutes by hand. Shape the dough, then place in a bowl. 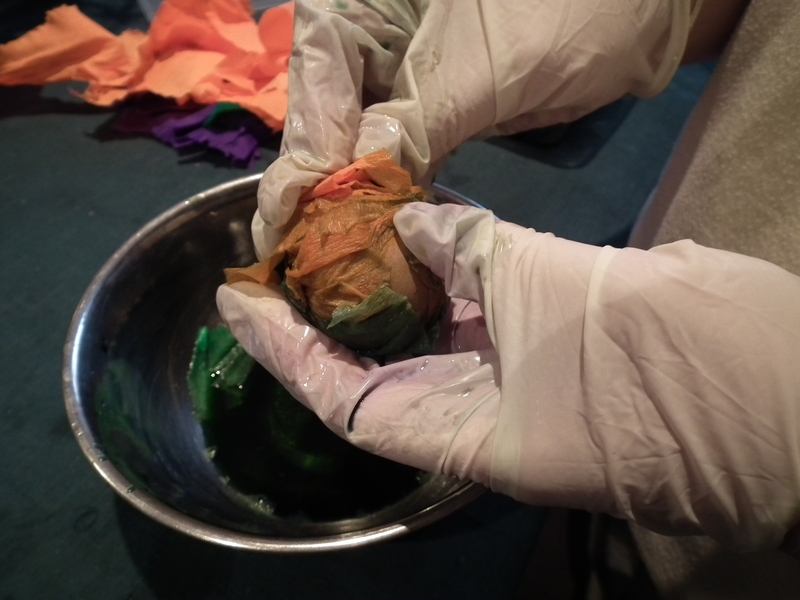 Cover with a clean damp cloth and let rise in a warm place until doubled in volume, about 1 hour. Deflate the dough and turn it out onto a lightly floured surface. 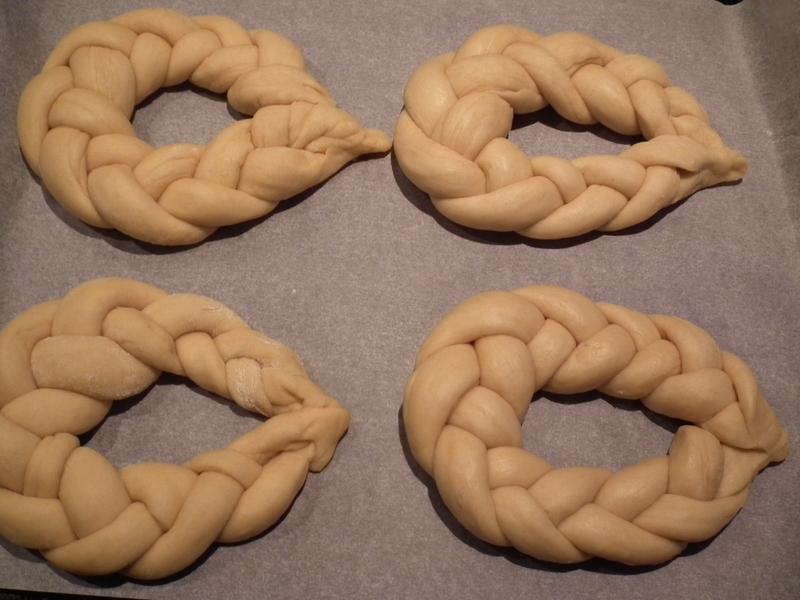 Divide the dough into four equal size rounds; Each roll should be divided into three equal pieces which are rolled round into three long strand about 40 – 50cm. 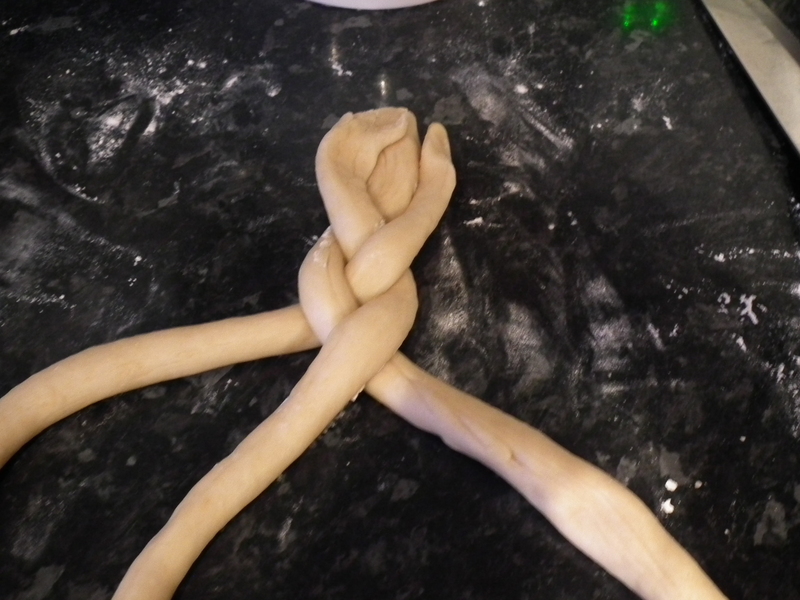 Form a loosely braided ring and place in the baking tin covered with baking paper. Brush each braided ring with egg wash. Egg wash is used to enhance the top crust of the bread. 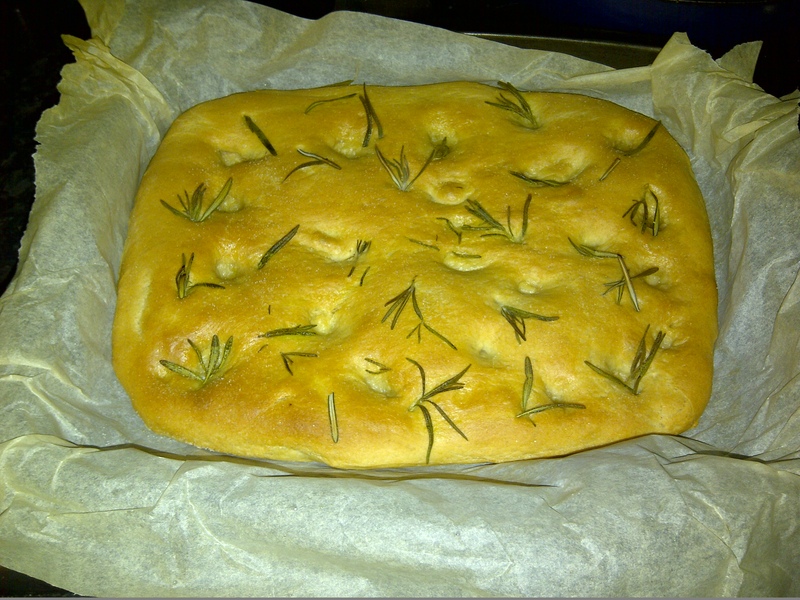 It adds shine and crispness, and enhances the beauty of the breads. 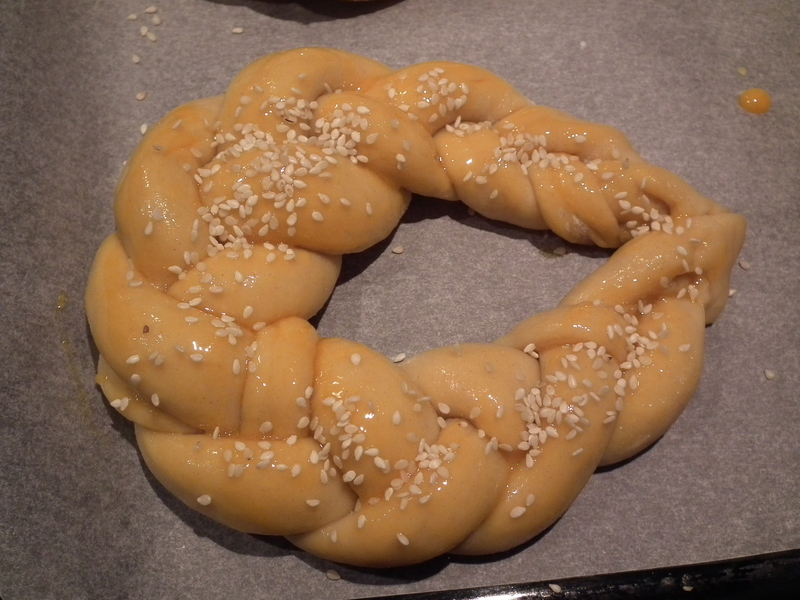 Add some sesame seeds on top. Bake in preheated oven for 30 – 40 minutes, or until golden. First time I went to Thailand, and tried their local cuisine, I knew that my new love for Thai food will last for a long time. You have to see my face when I first tried Wing Bean Salad which stayed my favorite salad until today. Sadly no restaurants in the UK prepare this salad and I just have to wait another opportunity to go to Thailand to eat it again. I think it is worth a trip. Thai cuisine is based on five primary flavours that are used in different proportions to create amazing, the most delicious dishes. The foundation flavours are: salty, sweet, sour, bitter and hot. 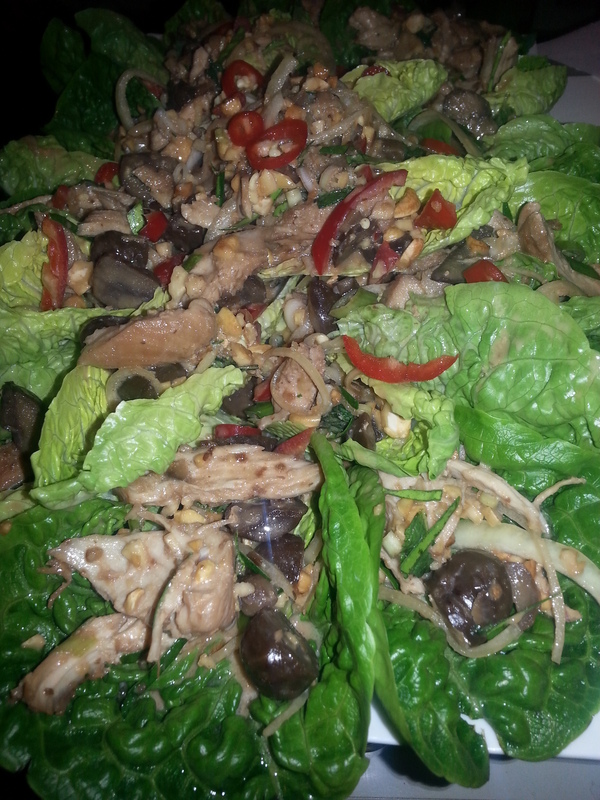 This extremely fresh and zesty chicken salad has all of the main flavours and more. It does not take a long time to prepare and every time I serve it to my guests, it disapeares in minutes. 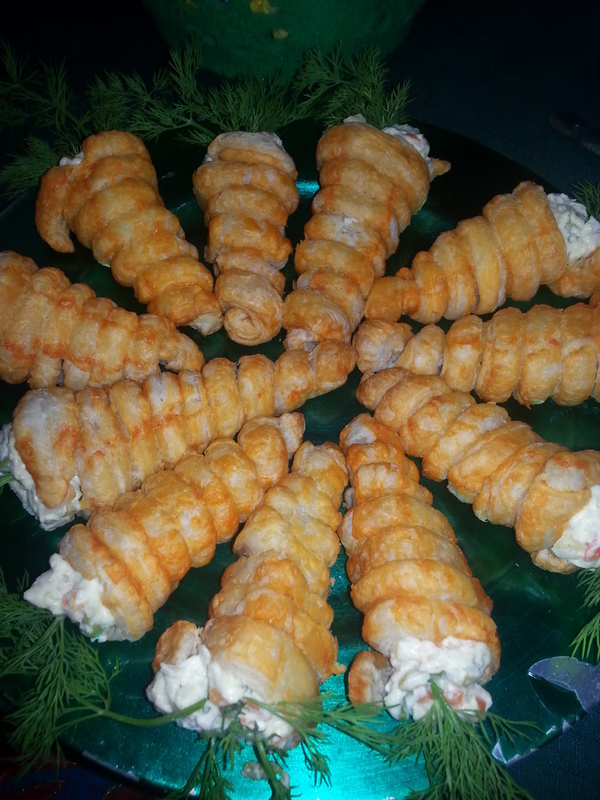 Its great for parties, snacks and as light meal for lazy summer day. 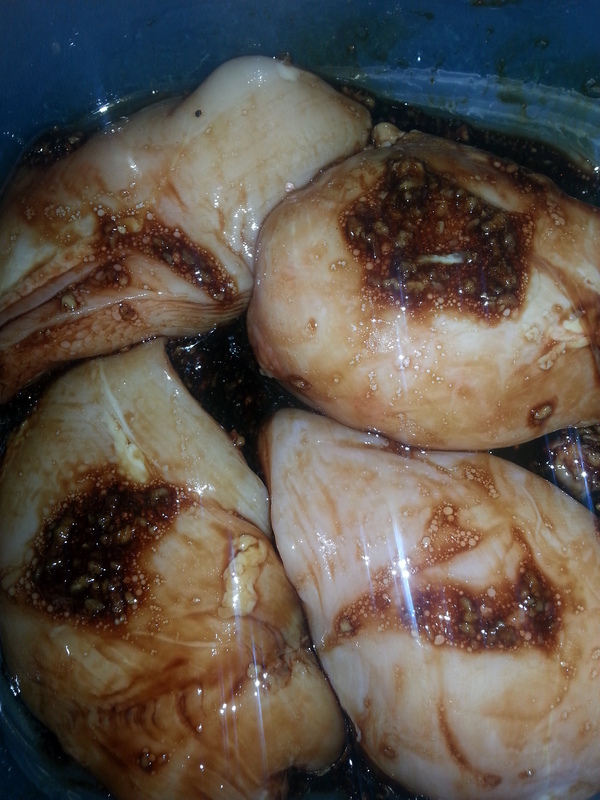 Place chicken with garlic, soy sauce and vegetable oil in the bowl, cover it and leave in the fridge to marinate for about 1 – 2 hours. I sometimes leave it overnight. The second step is to heat the wok or frying pan and stir fry the chicken for 5-6 minutes on each side or until completely sealed and cooked. Leave on the side to cool. In the same pan, add coconut cream, fish sauce, sugar and lime juice and stir until sugar had dissolved. Set aside. 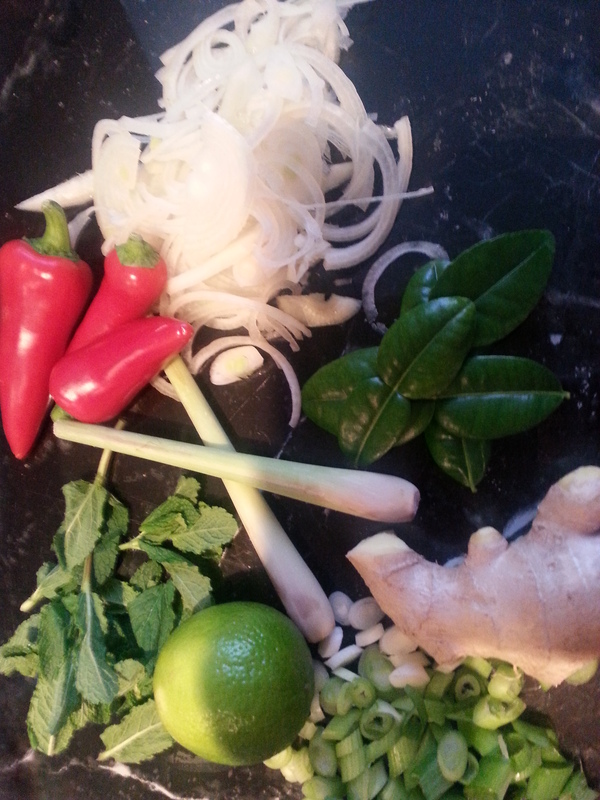 In the meantime, in the bowl put all the other ingredients together: chestnuts, cashew nuts, shallots or onions, kaffir lime leaves, lemon grass, galangal, red chilies, spring onions and mint leaves. Tear the cooked chicken into strips and put with all other ingredients. 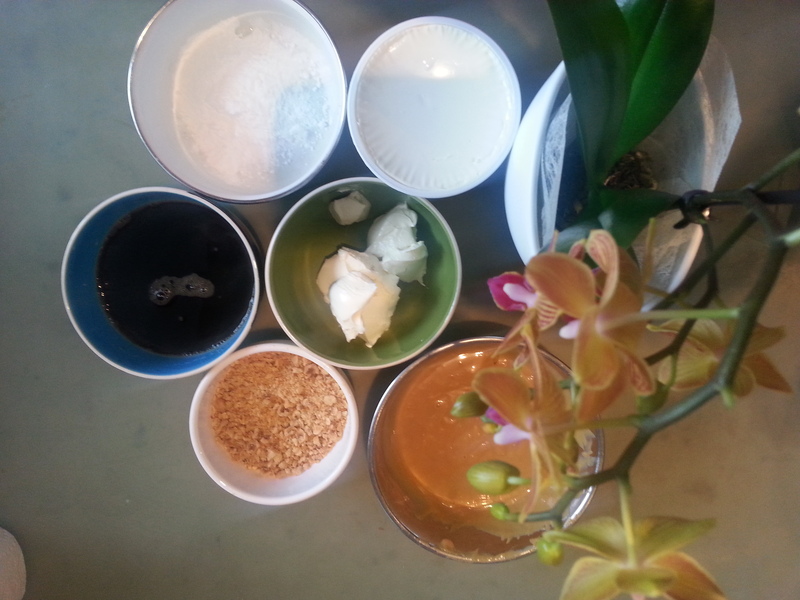 Pour the coconut dressing over the mixture and toss well. Prepare small gem lettuce but spreading them on the plate. 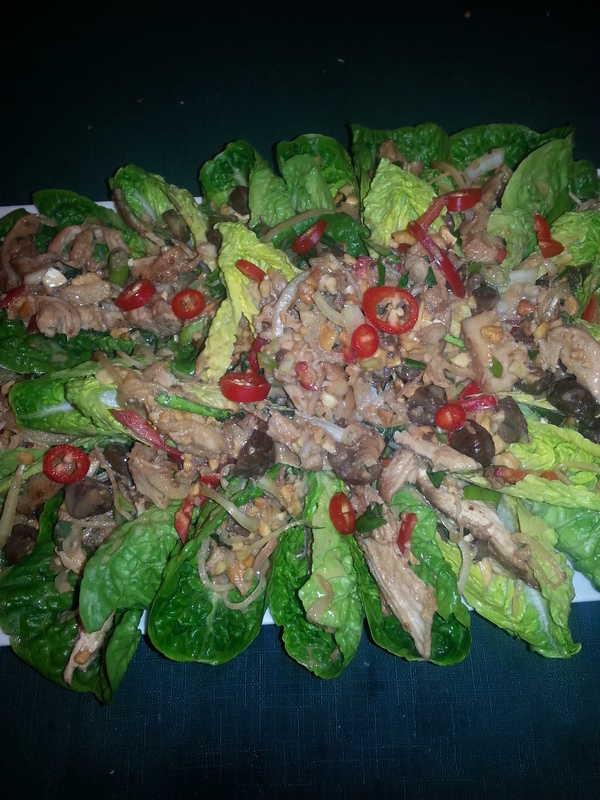 Place the chicken salad on each lettuce leave so it is easy to be taken by hand and eat in a second! Garnish with red chilies. This cake is my take on the world famous Tiramisu cake. As I don’t like coffee very much I decided to use almond infused coffee and add a splash of rum instead. I also used toasted hazelnuts to add crunchiness to this moist and creamy refreshing cake. The typical mascarpone cream filling is enhanced with the taste of caramelised Dulche de leche. I didn’t want to call it another Tiramisu cake as it deserves its own unique name. When I fall in love is a cake dedicated to the things I absolutely love: roasted hazelnuts and Dulche de leche. Cake – Heat the oven to 180C. Prepare 10′ round baking pan, greased with the parchment paper on the bottom. Mix eggs and sugar using a high speed on your hand mixer. When the butter is light and creamy, slowly add sifted flour and the baking powder. Mix it on a low speed until all combined. Pour it into a baking pan and bake it for 35 – 40 minutes on 180C. Once it is done, leave it to cool before you take it out of the baking tin. Dulche de leche – You all know my obsession with this delicious and sweet South American invention. I used to buy can of Dulche de Leche in the local store, either Waitrose or Wholefoods but this time I could not find it anywhere. I checked Tescos, Planet Organic and even Sainsbury as some other bloggers suggested but no luck. Therefore I decided to make it my own. You can find many recipes online how to make it your own and the one I decided to go for is the oven baked version. It was so easy to make it and I am forever great to Bakers Royale recipe. 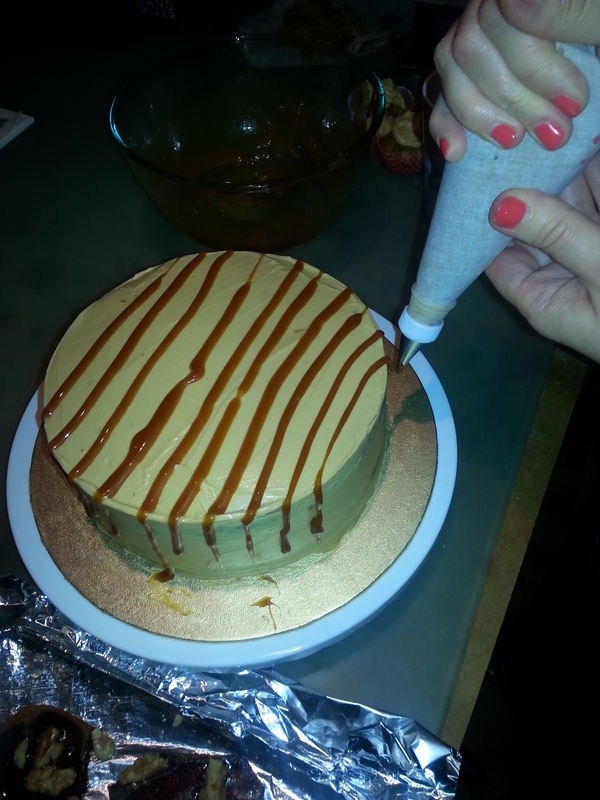 In 90 min and no effort you can get this delicious and creamy caramel sauce which worked extremely well in my cake. 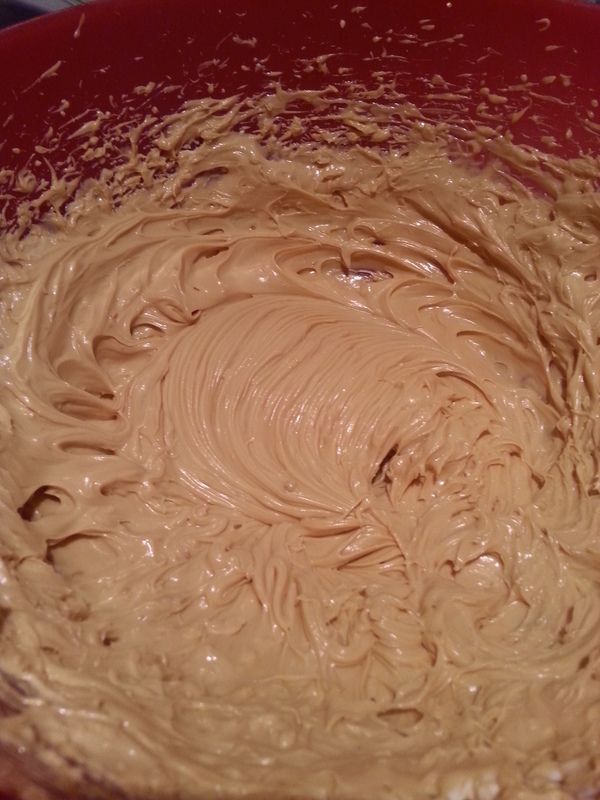 Filling – Beat the cream cheese with Dulche de leche in the large mixing bowl. Add mascarpone cheese and beat no more than 1 minute, just until all combined. In a separate bowl prepare whipping cream and once it is done, combine with the cheese mixture. As a not crazy coffee lover, I used Amaretto coffee (almond infused coffee) which I mixed with rum. If you do love coffee taste you can use regular coffee instead. 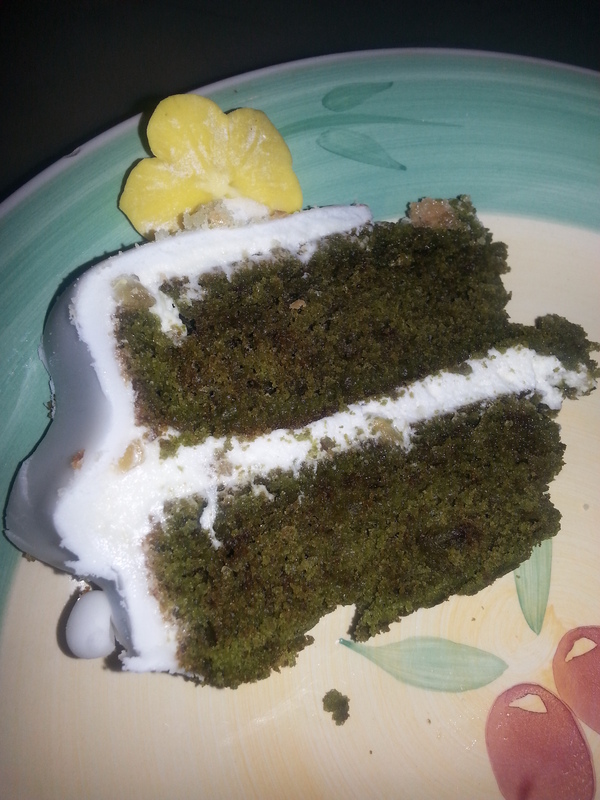 Cut the cake vertically into two parts. Heavily brush the bottom cake with the cake and rum mixture. 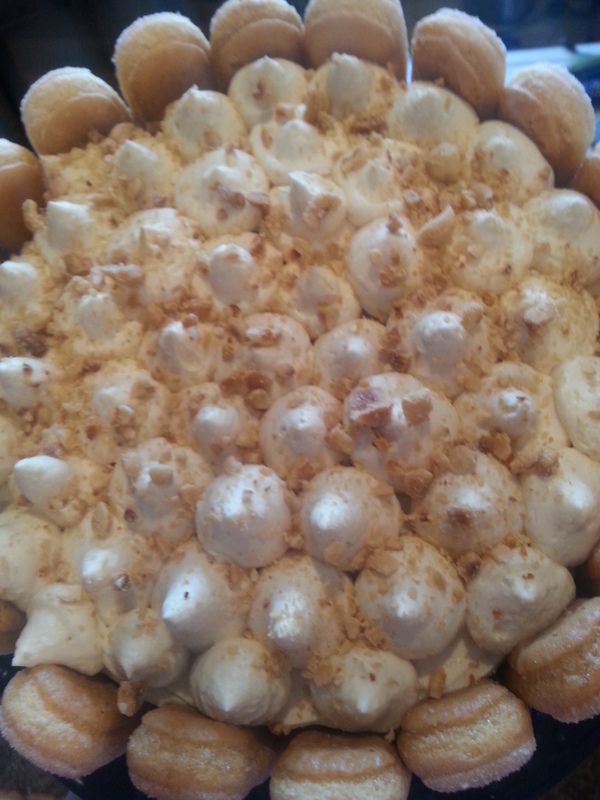 Spread some cream filling and cover it with the crushed roasted hazelnuts. 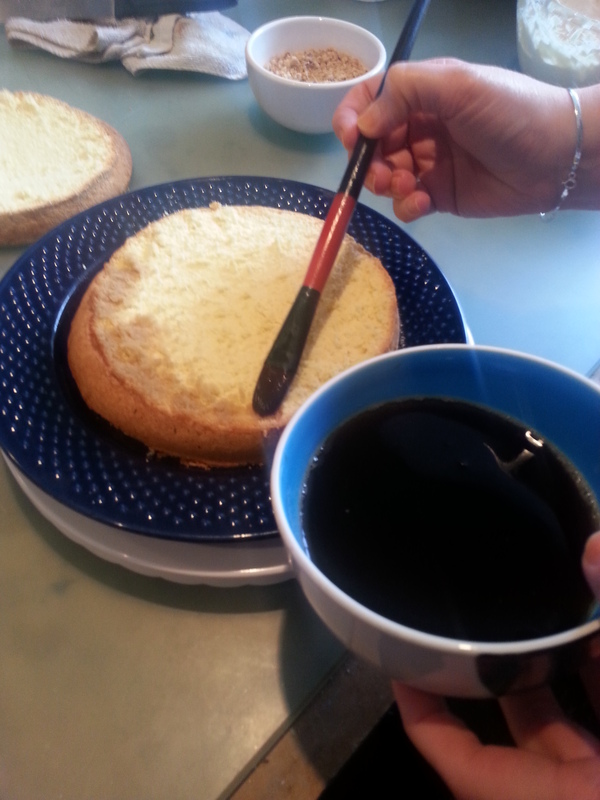 Brush the other half of cake sponge with the coffee – rum mixture and place it on top of the bottom layer. 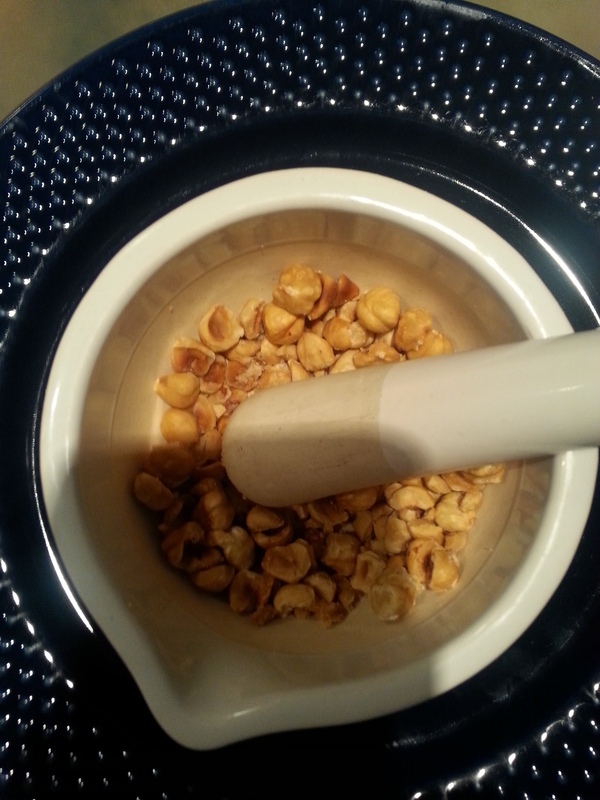 Add cream filling on the top and sides of the cake and decorate it with the roasted hazelnuts. 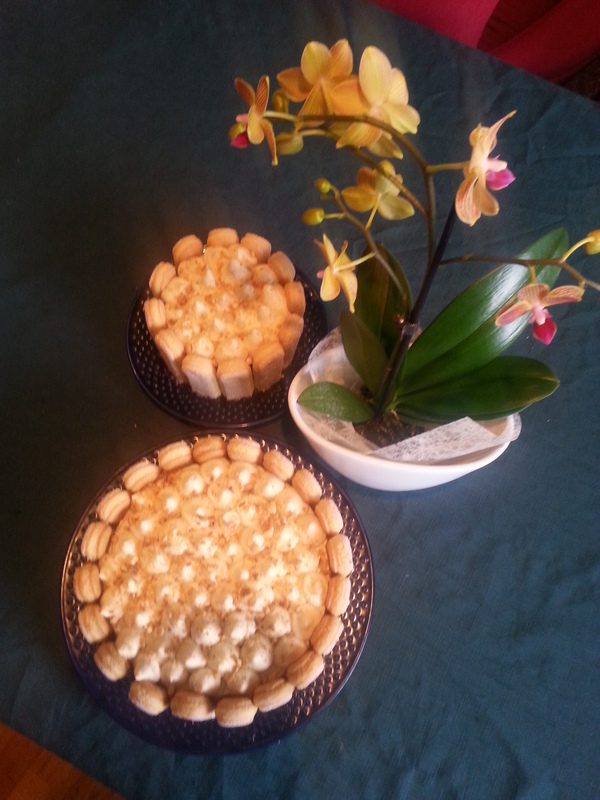 I dipped lady fingers biscuits into a coffee mixture and place them around the cake. Cake was in the fridge for 24 hours before I served it. It is always sad to see the end of the year but at the same time very exciting as you do not know what will next one bring! I am very much looking forward to a new 2015 and the challenges that it will bring. However I am ready to embrace it with the open arms and a smile as I learned some much in 2014 that I will cherish and take it with me. 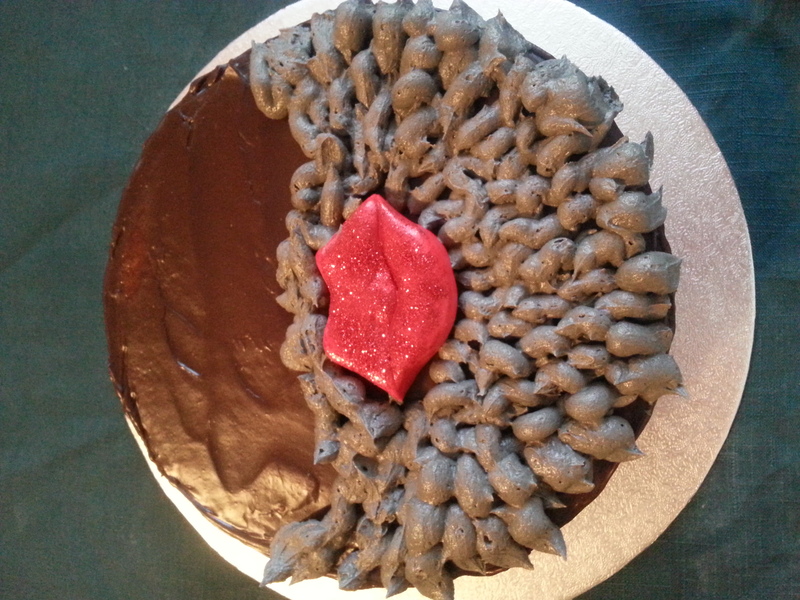 Through our amazing and fabulous Camden Clandestine Cake Club I met so many new friends and I baked so many new cakes and treats which I also shared with you. 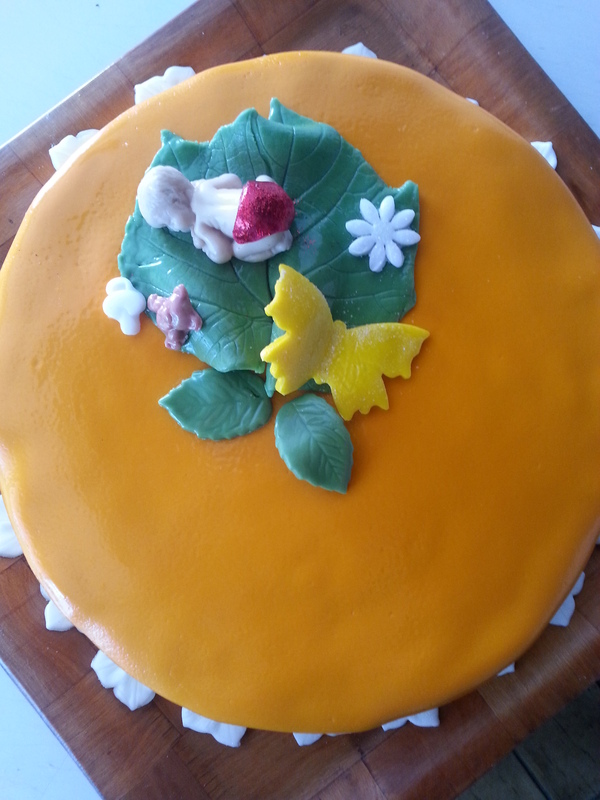 I attempted my first Christening cake for my gorgeous niece Dunja (which means Quince and certainly a fruit that was not as used here as it should be with a distinguish flavour and taste). 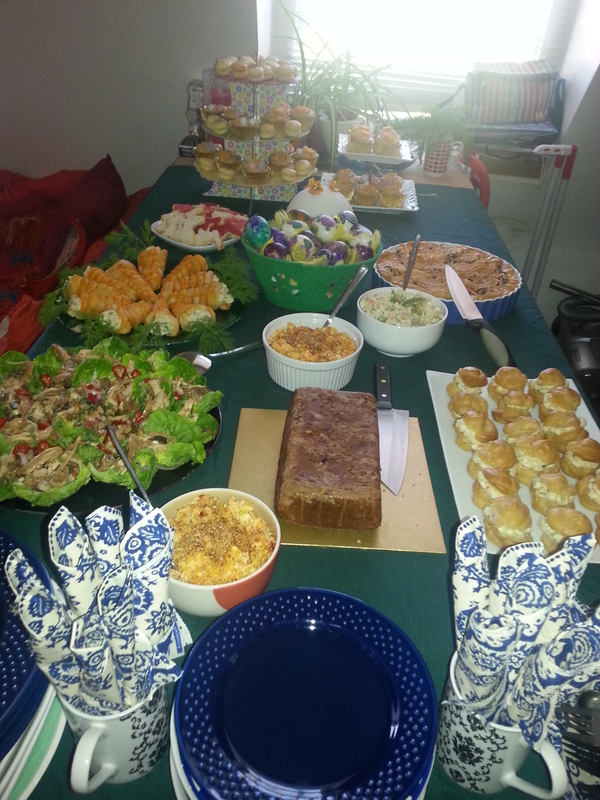 I also hosted my birthday party for my friends who were spoiled with a choice of macarons, Strawberry and Rose Dome Cake, Easter pastry carrots, Date and walnut cupcakes and many other yummy things. I also made 12 different cakes representing each month in 2014 for our club. I learned, like my friend Fiona that you should never put the iced cake in the fridge as the icing will melt! Lessons learnt! I also learned to leave your cake in the tin once its baked – do not take it out immediately. Leave it to rest. That does not goes for macarons that should be removed from the parchment paper the same moment you take it out of the oven! I tried many recipes with apples and some of them just did not work. 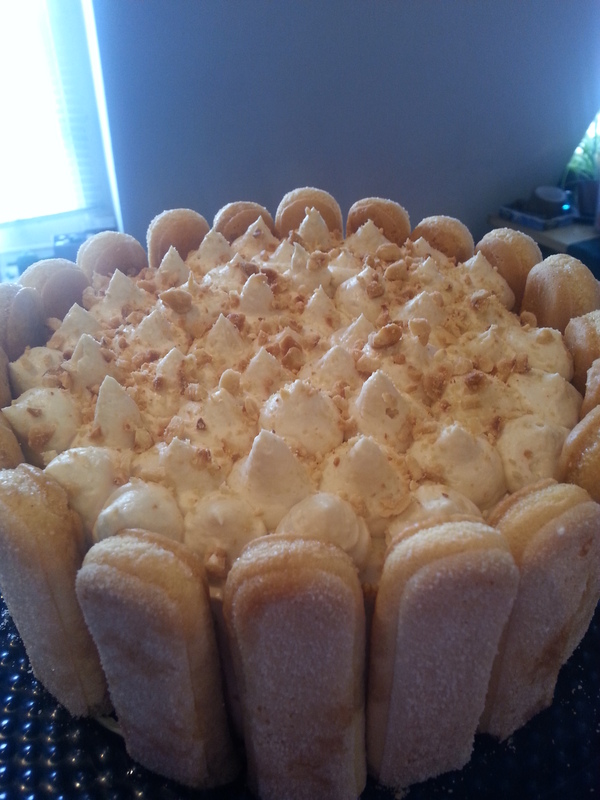 I wanted to create something zesty and fresh while creamy and sweet. As my love for caramel does not have an end, this combination of apple cake with caramel frosting just work perfectly. 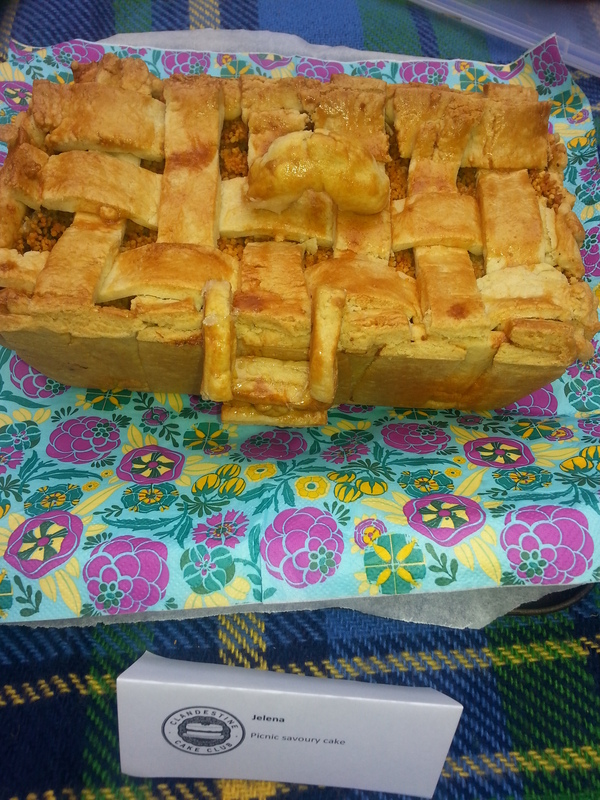 Recipe is adopted from the one I traced online using cut apples in the butter. I grated them instead which work much better. 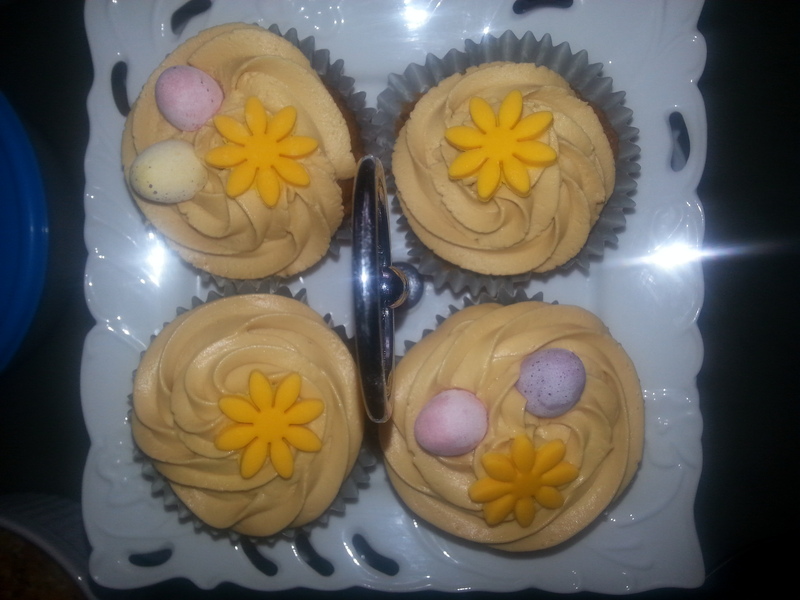 Sugar is reduced to a minimum as caramel frosting had plenty in it. The cake is very simple to make and can be decorated in hundred different ways. 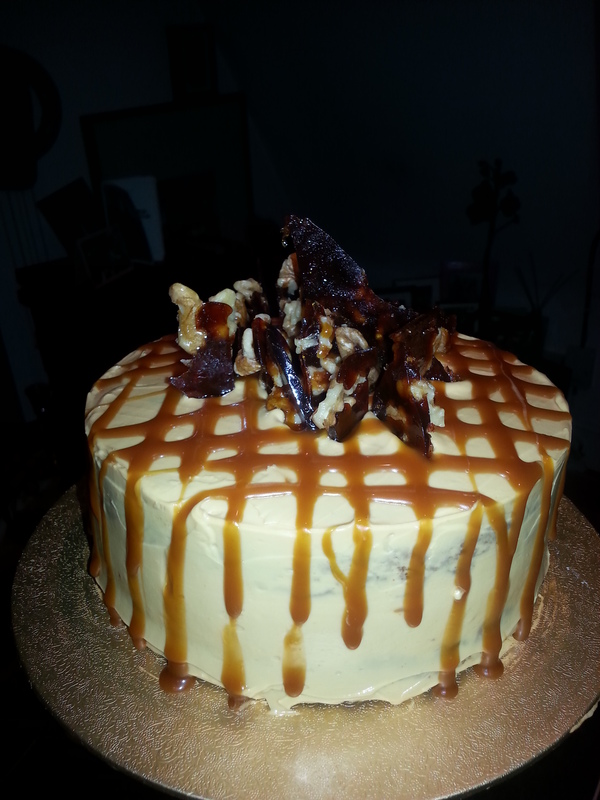 I used caramel and walnut shards which looks very attractive and they were delicious too. 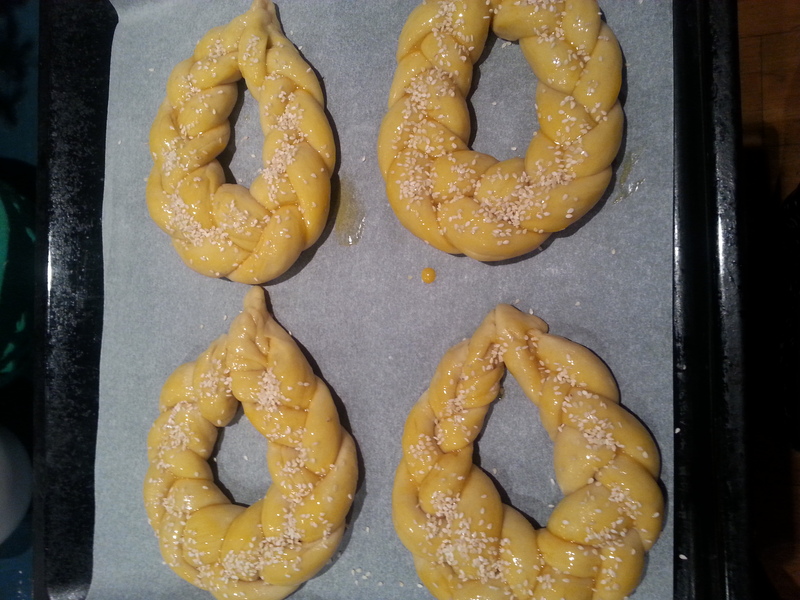 Preheat oven to 170 C. Grease and line the bases of the 20 cm sandwich tins. I only have one so baked the butter in two batches. 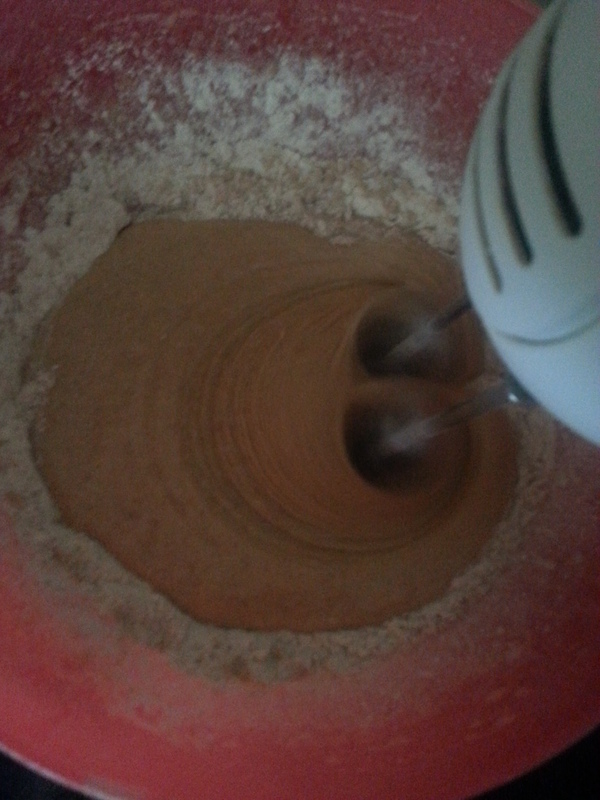 Sift together the flours, cinnamon, baking powder and salt. 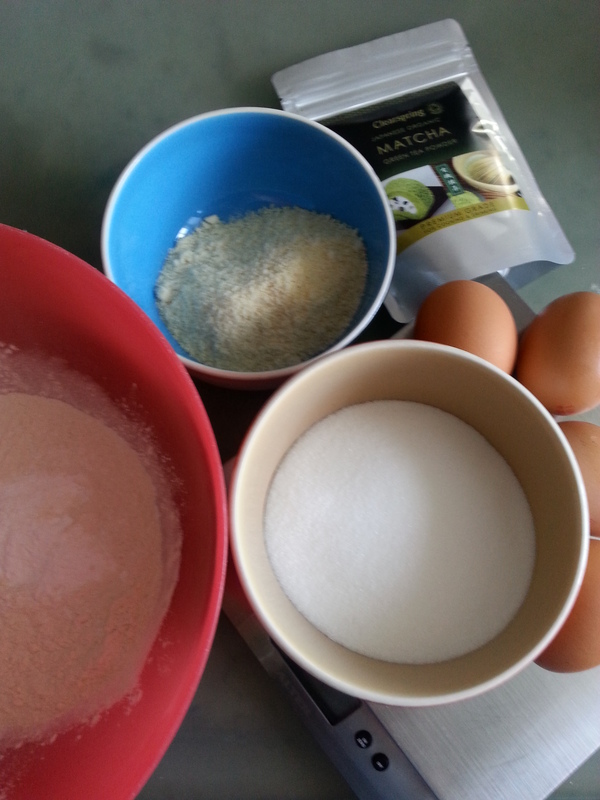 In a bowl, beat the oil and sugar together with an electric hand whisk until smooth. 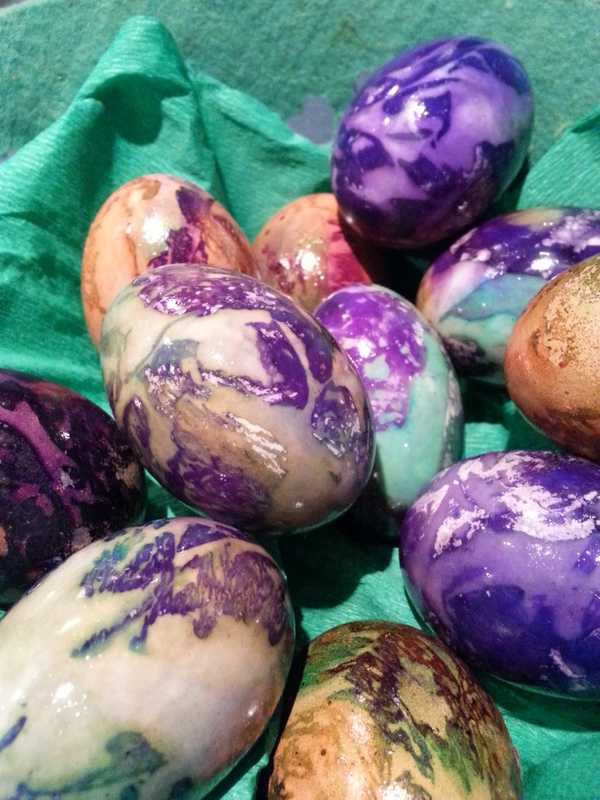 Add the eggs one at a time and continue to beat for 2 to 3 minutes. Slowly add the dry ingredients until it forms a thick, smooth batter. Fold in the walnuts, apple and rum. Divide mixture between tins and bake on the middle shelf for 35 – 40 minutes, or until a skewer comes out clean when inserted in the cake’s centre. Leave in the tins for 10 minutes then turn out onto a wire rack to cool. While the cake is cooking, make the caramel. Dissolve the sugar in a small saucepan over a low heat. 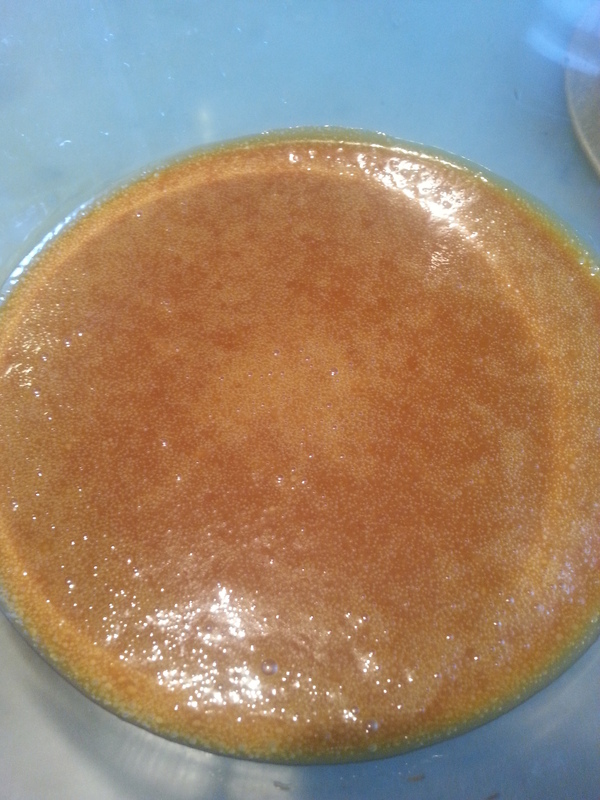 Once the caramel has gone deep amber, remove from heat and slowly add the cream. Stand back as you do it – it will bubble like mad. Return to heat and stir for a minute. Transfer to a bowl and allow to cool. Do nor eat it at this stage, although it is so yummy. For the frosting, blend the cheese with 225ml cold caramel and the lemon juice using an electric hand whisk, reserving the rest of the caramel for decoration. 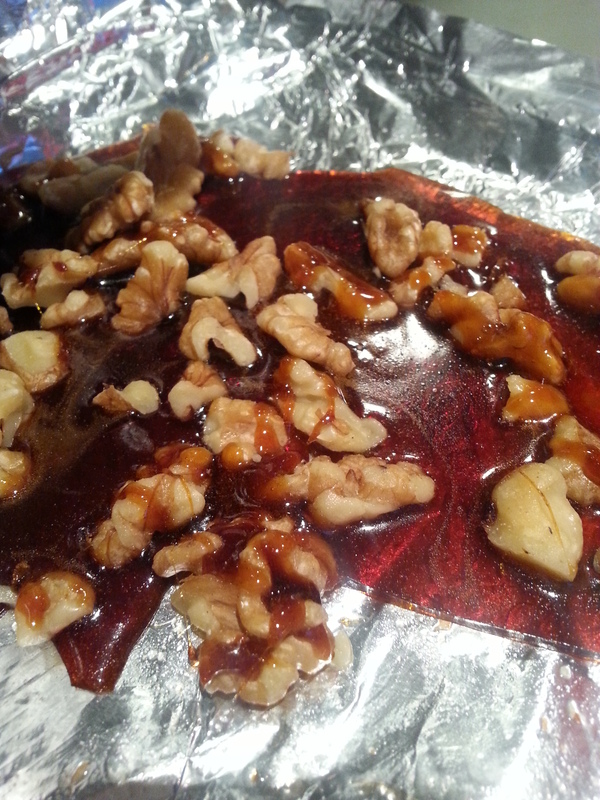 To make the caramel shards, lightly oil a sheet of foil and dot over the walnuts, spaced a little apart. Melt the caster sugar in a pan. 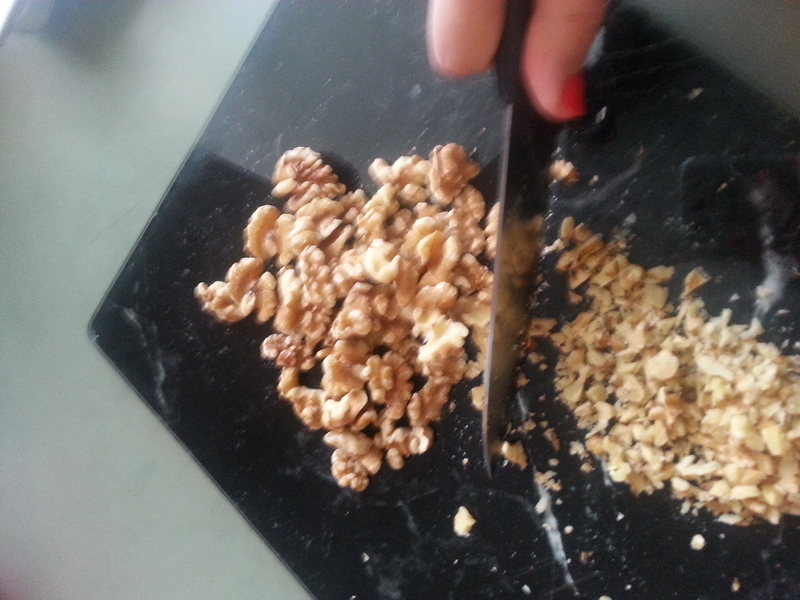 Once it has caramelized, pour over the walnuts and allow to set. 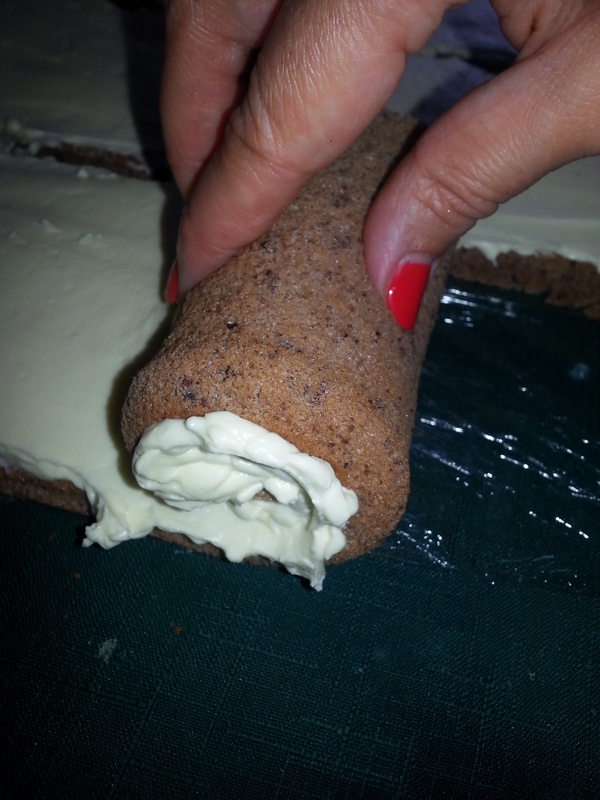 To assemble the cake: once the cakes are cool, use 1/3 of the icing to sandwich the two layers together. 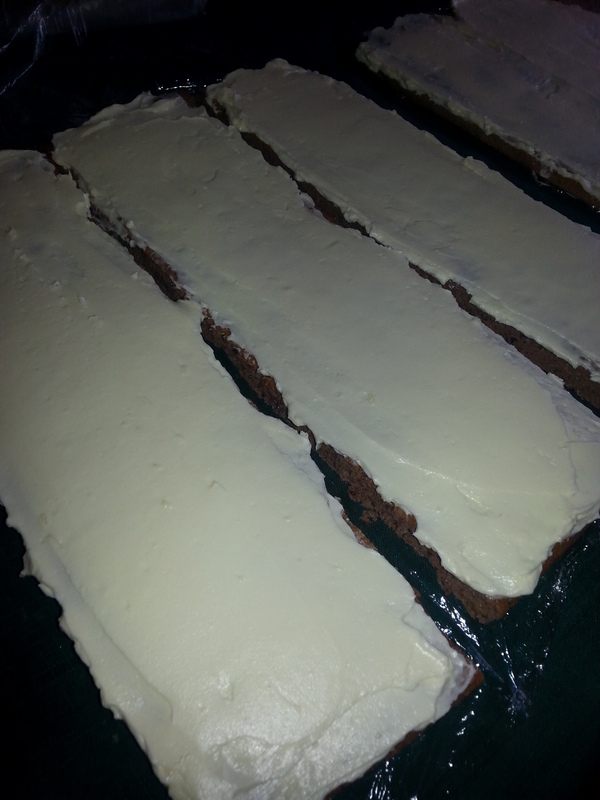 Spread remaining icing over the top and around the sides, using a palette knife. Drizzle the leftover caramel over the iced cake. 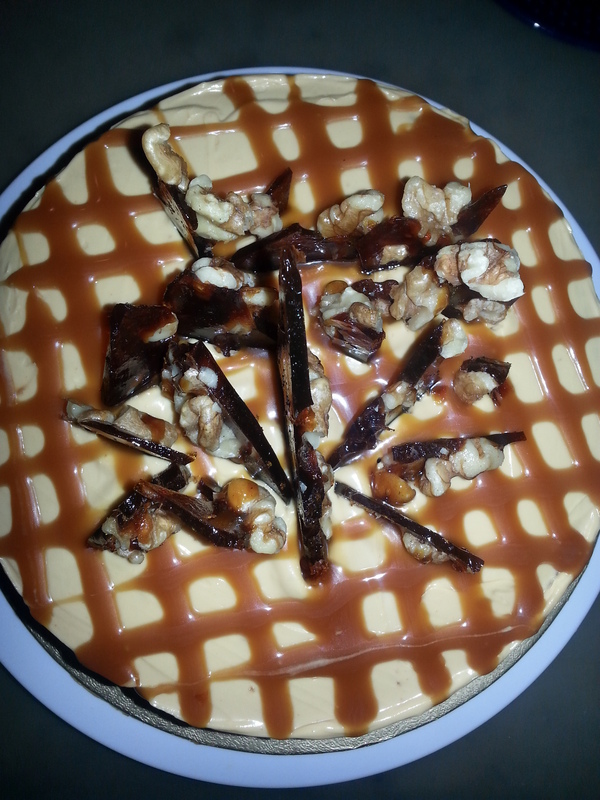 Break up the hard caramel into shards and arrange on top of cake. Still working through my favourite book at the moment ‘Bake like you mean it’ by Gessine Bullock Prado and next in line after Key Lime and Berry Sponge, is Because you are mine cake. What I learn so far is that all Gesine’s recipes are meant for at least 50 people! Her cakes are HUGE! 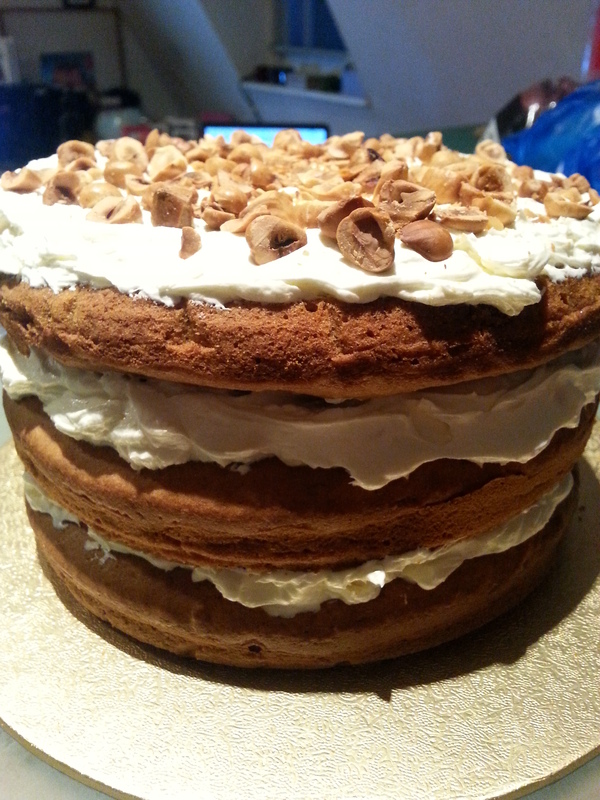 In this monstrous gigantic cake, I used 24 eggs and almost 1 kg butter! Seems like very expensive cake. I feed 20 people and I still had almost a half a cake left. Therefore you can only use half of the ingredients or even use 1/3. 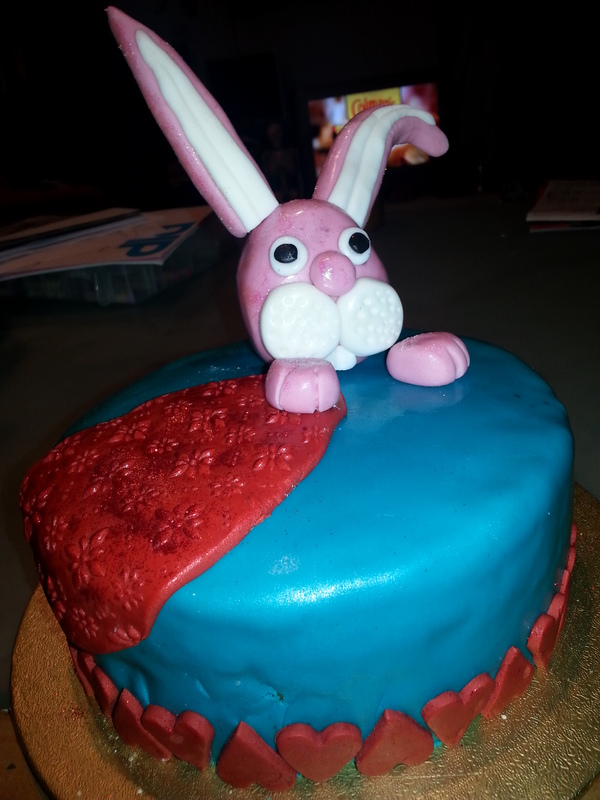 In any case, the cake was very easy to make and the effect was amazing. Delicious too. 1. Preheat oven to 180C. Butter the 25 cm cake pan and line the bottom with parchment. 2. Combine together butter and granulated sugar until light and fluffy. 3. 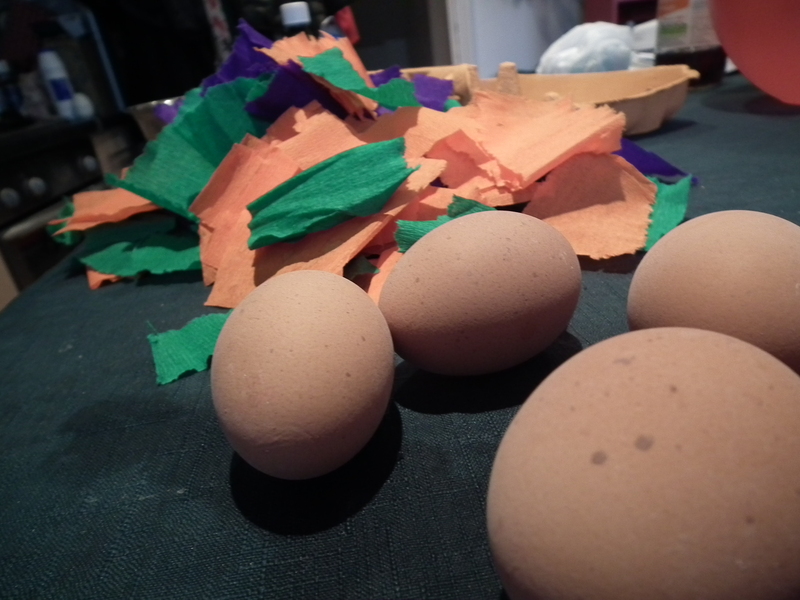 Add eggs, one at a time until they are all incorporated. 5. In a bowl, whisk together flour, salt and baking powder. Add 1/3 of the flour and then 1/2 buttermilk. Add another 1/3 of the flour mixture and then the remainder of the buttermilk and finish of with the remaining flour. Mix until just incorporated. Don’t overmix! 6. Fill the pan with batter and bake for 20 minutes, until done. Poke that cake and make sure it springs back to insure it’s done. 7. Allow to cool completely. Remove from pan and carefully cut the cake in half. Set aside. 3. Whip the egg whites with the salt until foamy and then slowly add the remaining sugar. Whip until stiff peaks form. 4. Whisk together the flour and the cocoa powder. 6. Divide the butter evenly between the prepared pans and smooth the layers. Bake for 7 – 10 min, until the cakes spring back when you touch them. Let them cool completely. 1. Combine the egg whites, granulated sugar, vanilla, and salt in the bowl. Place over a baion marie (a large saucepan half full of simmering water) and stir until the sugar has completely melted. 2. The candy thermometer should show at least 160F on which bacteria are killed. 3. While you’re tending your sugar, whisk the egg whites and salt together until they are foamy. 5. Slowly add bits of butter, about 2 tablespoons at a time. There’s a chance you won’t need all of the butter. 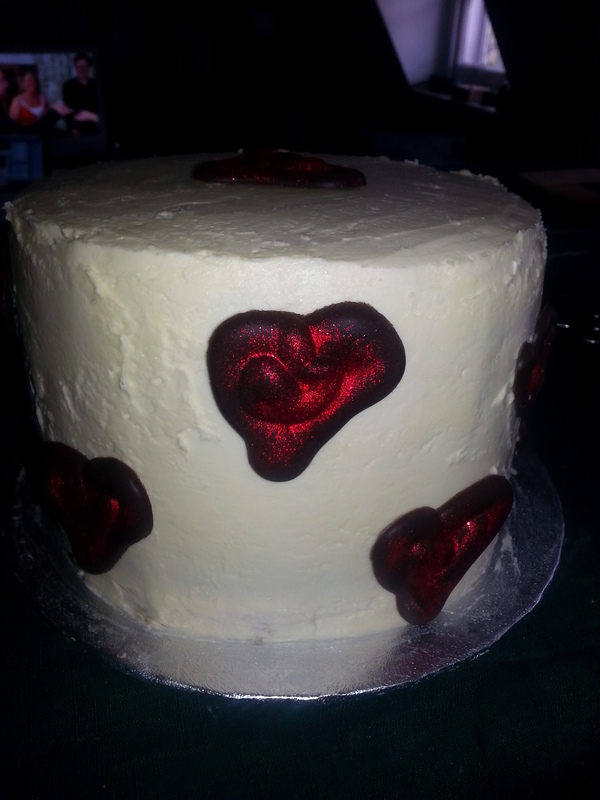 Keep an eye out for the texture of the buttercream, it’s takes some time to come together. But a visual cue is when it looks as if its starting to separate or curdle. This is an indication that with a little more whisking, the buttercream will smooth out and be ready. 2. Pour the hot cream over the chocolate, making sure the chocolate is completely covered. Allow to sit for 2 min. 3. Whisk until the chocolate in completely melted and the mixture is smooth. 1.Cut both roulades into long strips, 10 cm wide (you’ll get 3 strips from each pan which is 6 together). 2. Divide the buttercream evenly between the two cakes, reserving the rest to cover the cake and spread very thin, even later over the surface if each cake. 3. Roll the first strip, the cream side in, into a tight roll. Move the strip over to the start of the next strip, and continue rolling, the end of the first roll touching the beginning of the second, and you’ll keep add strips to make a big fat spiral of cake! A snowball effect but in cake! You may have more cake than you need. Stop when you’re spiral is 25cm wide. 4. 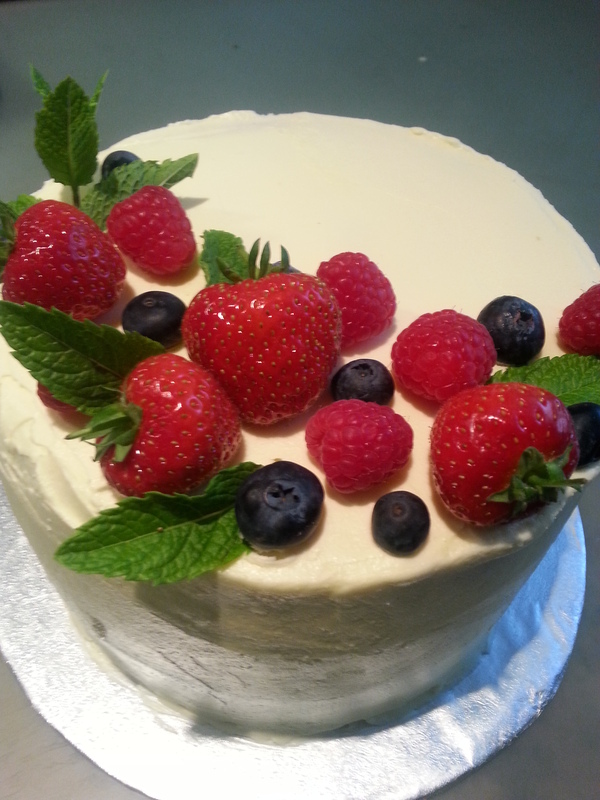 Add a thin layer of buttercream to one of the vanilla cake layers, just enough to cover the top. Place your giant spiral on top of the buttercream. 5. 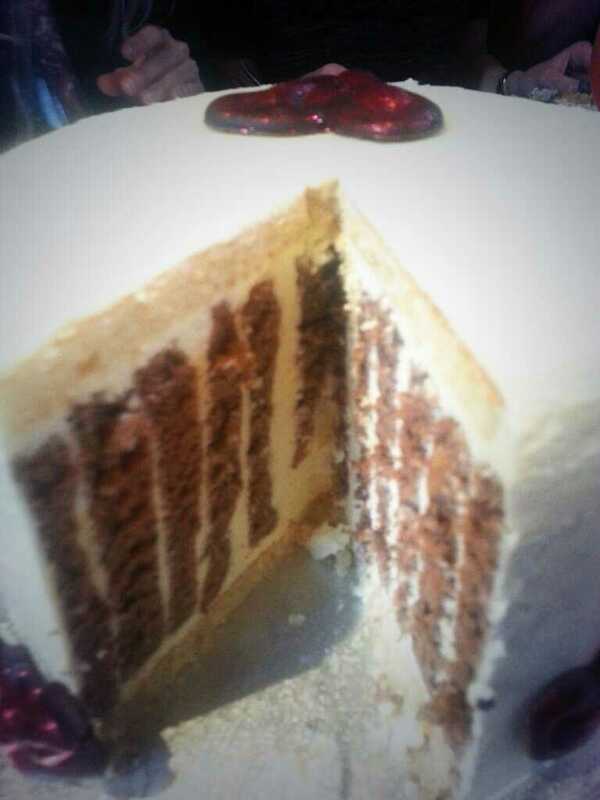 Smear a thin layer of buttercream over the top of the spiral cake and top with the remaining layer of vanilla cake. 6. Wrap it in plastic wrap. Place the cake in the freezer to set for 1 hour. 7. Remove the cake from the freezer and cover the entire cake with the layer of buttercream. 9. Place the ganache in a pastry bag fitter with a medium open tip. Place a piece of parchment on a sheet pan and pipe hearts onto the parchment paper. Freeze the harts until set. 10. 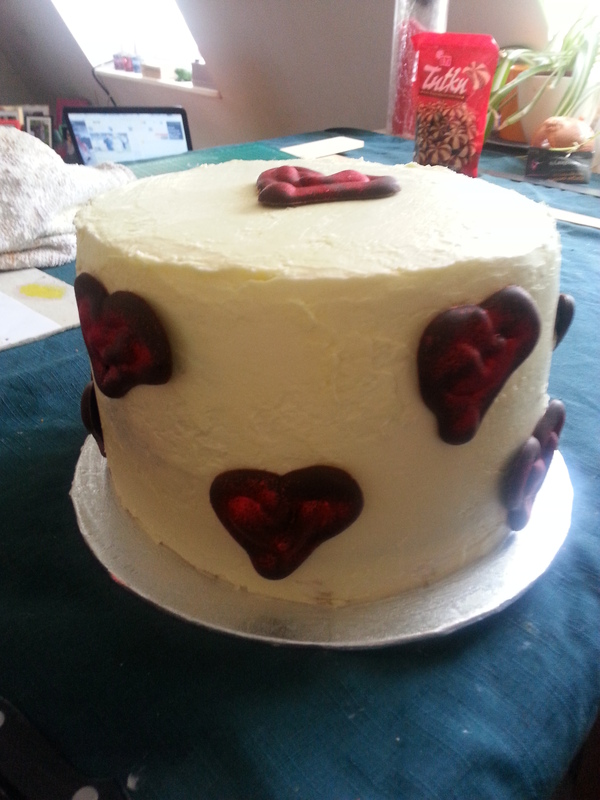 When the ganache hearts have hardened, remove them from the parchment paper and stick then on the side and top of the cake.